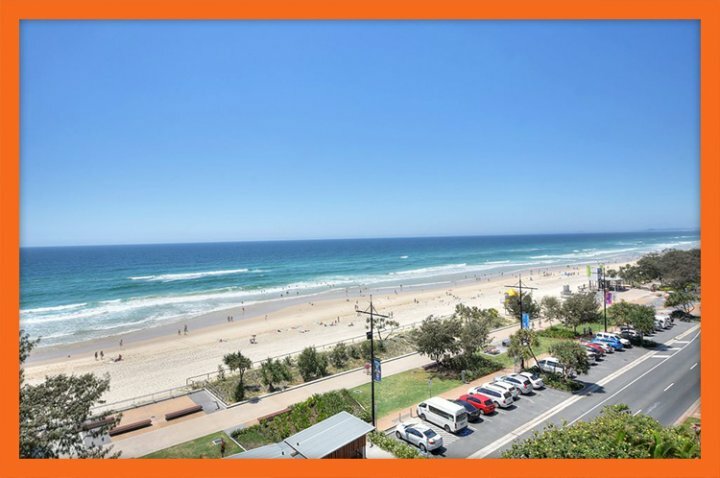 Located just metres from Surfers Paradise Esplanade and Surfers Paradise Beach, the Moroccan Resort is one of the most popular holiday resorts on the Gold Coast. 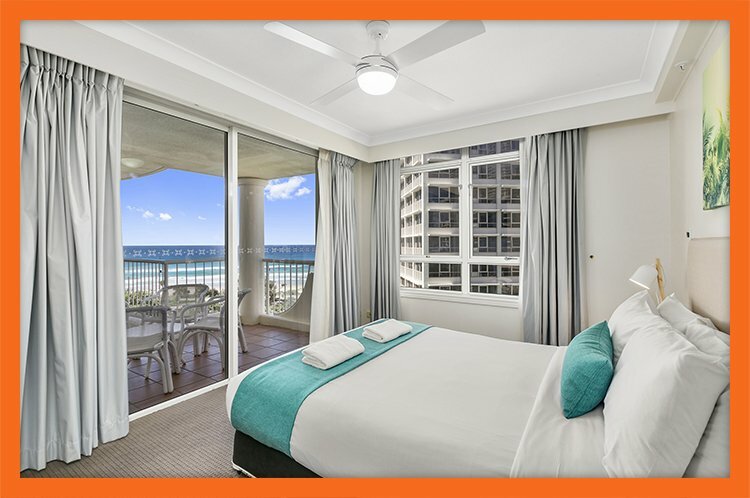 This 3.5 star resort is located in the heart of Surfers Paradise, just 20 metres from the beach and 250 metres from Cavill Avenue. The resort offers plenty of facilities to keep you entertained. Relax and take a dip in the outdoor pool, the indoor heated pool or spa, take time-out in the sauna, or sweat it out in the resorts fully-equipped gym. The kids have a games room to keep entertained. 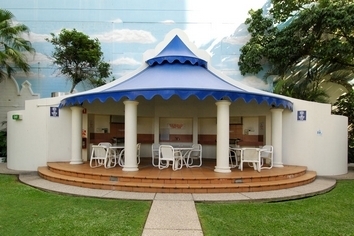 The resort also offers great barbeque facilities. Additionally, GCHR guests can take advantage of free undercover parking. 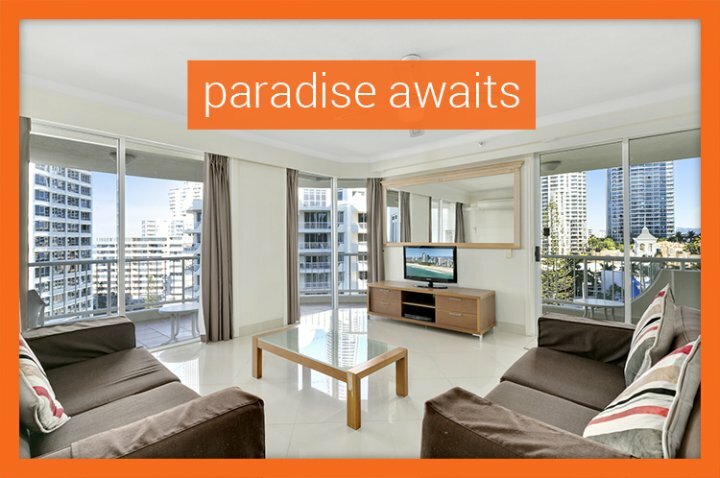 Beyond the resort, you are within walking distance to all the best attractions Surfers Paradise has to offer. 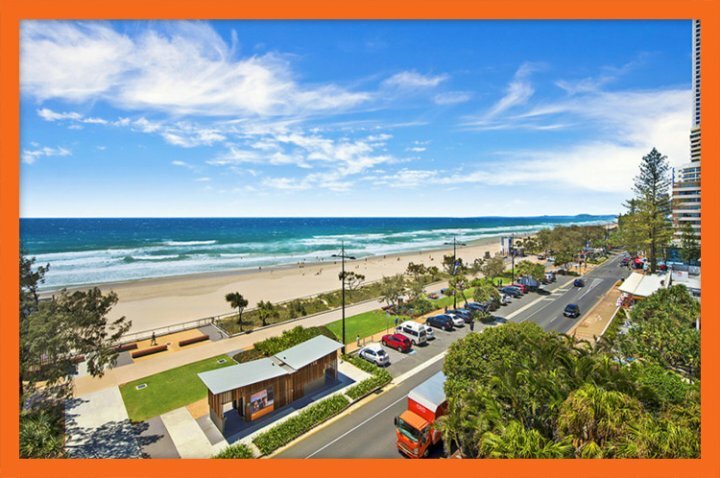 You can also jump on the light-rail and within a short 10 minute trip youll reach Broadbeach, where you can explore Oasis Shopping Centre, Pacific Fair Shopping Centre and Jupiters Casino. 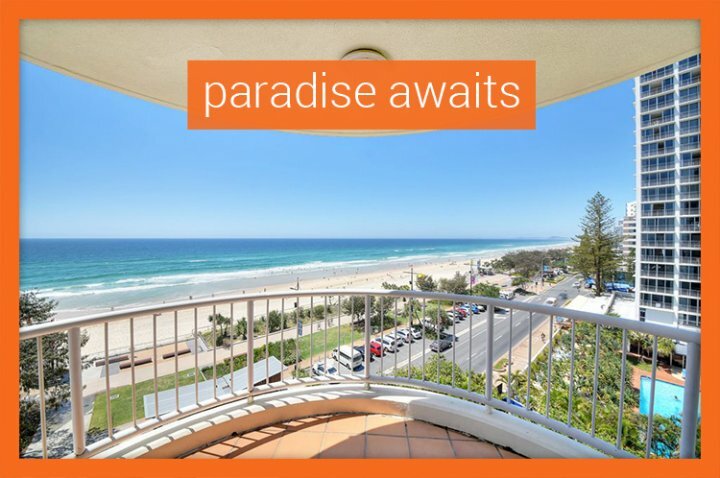 With its beachfront location, fantastic facilities and great value holiday accommodation, its easy to see why Moroccan Resort continues to be one of the most popular resorts on the Gold Coast. 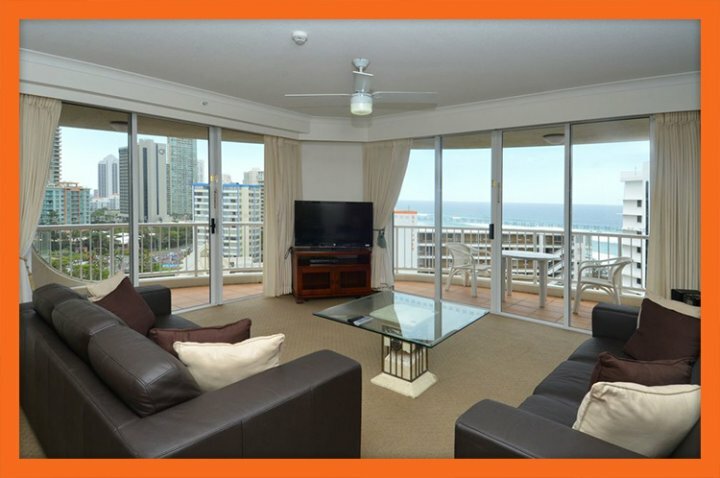 Apartment Overview For beachfront accommodation in Surfers Paradise, you need to look no further than Apartment 123 of the Moroccan Resort. 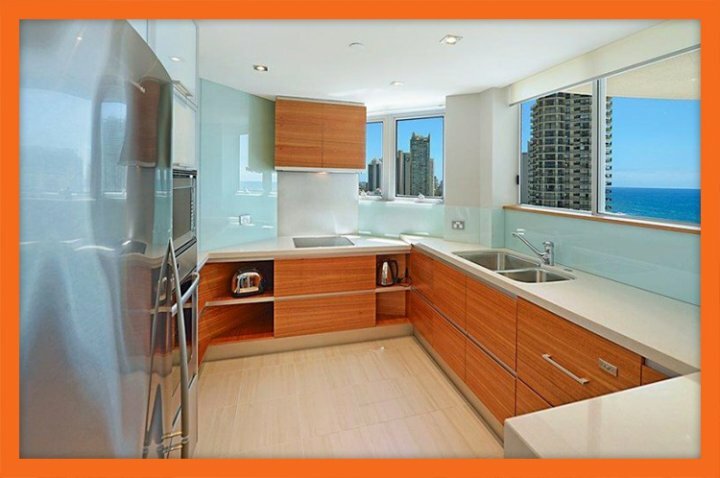 Inspired by the Mediterranean, this apartment lies just across from the Surfers Paradise Esplanade and is close to the major tourist and entertainment hubs of Surfers Paradise. 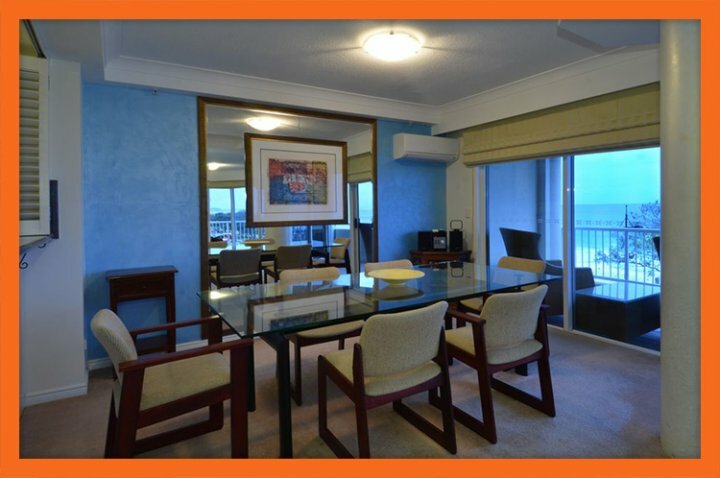 Apartment 123 is an elegant 3 bedroom apartment, which is located on the 5th level of Moroccan Resort's Elkhorn Tower. 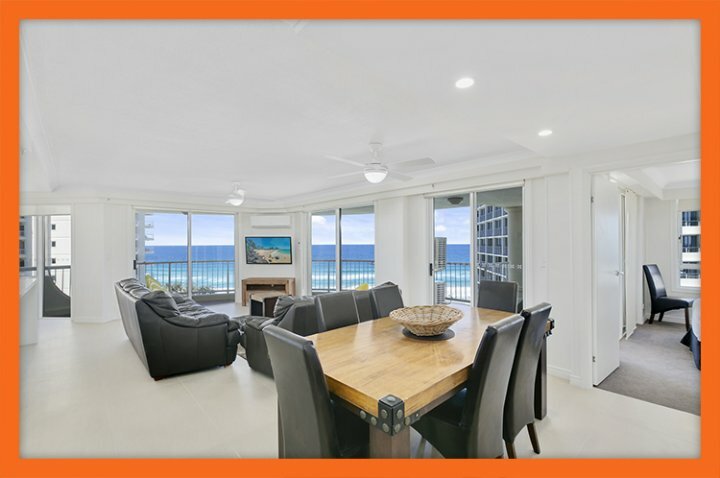 Reflecting a beachside setting, this gorgeous apartment offers enough space for a large family, or even for two families to share accommodation while on a Gold Coast holiday. This apartment has 2 bathrooms and a small powder room as well and offers the best of convenience, both for residents and for guests. 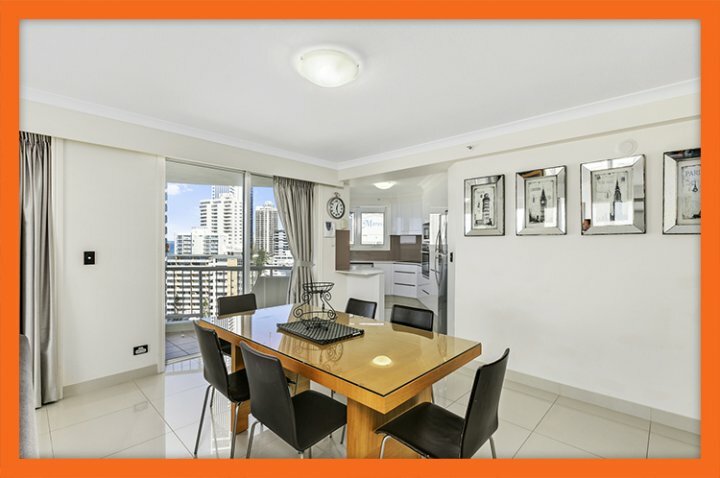 Apartment Features Apartment 123 is a fully air-conditioned apartment, which has been designed with a flair of elegance. 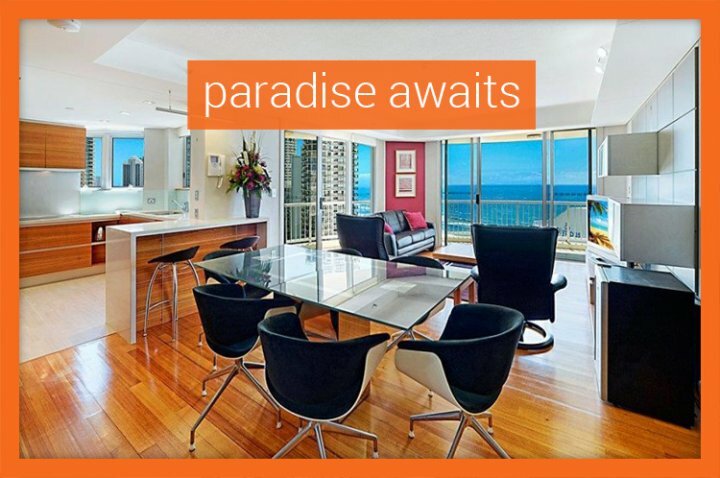 Some of the highlights of this apartment include an immaculate and large living area, a stunning balcony offering panoramic views of the Pacific Ocean, a chic and sophisticated dining area, a fully equipped kitchen and several entertainment features. 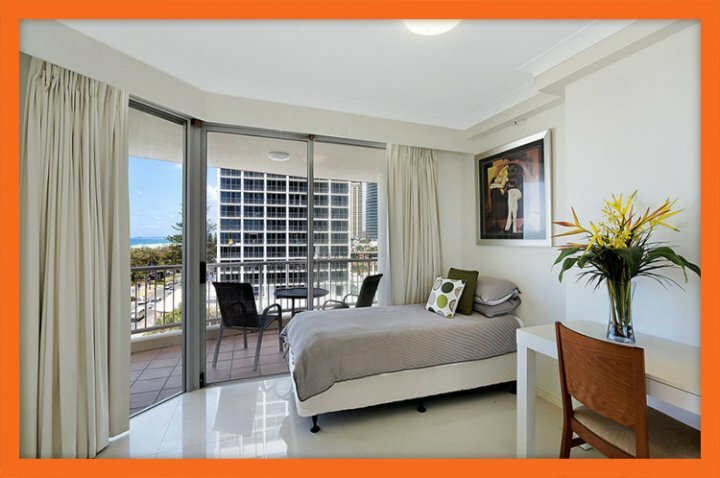 You'll definitely notice the savings, should you choose Apartment 123 for your Surfers Paradise accommodation. Furthermore, you can save on food costs by cooking your own meals, which, thanks to the gourmet kitchen, is an easy task. Separate meals area make dining a pleasurable experience and you can also dine outdoors on the large balcony. 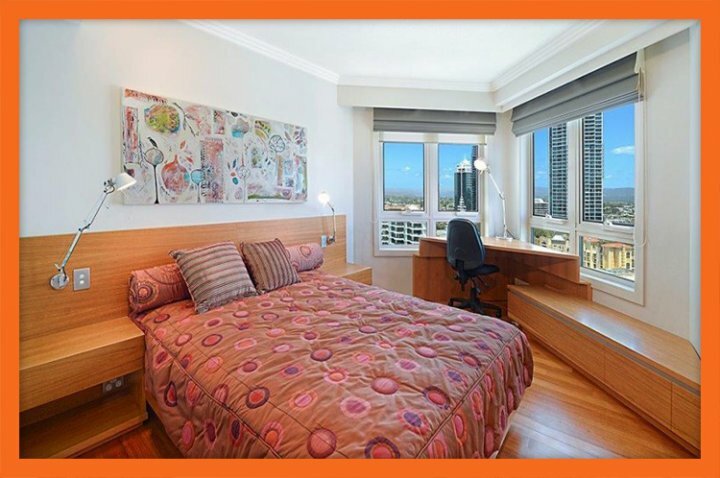 Bedding Configuration This apartment has 3 bedrooms, which are all spacious and feature a contemporary design. 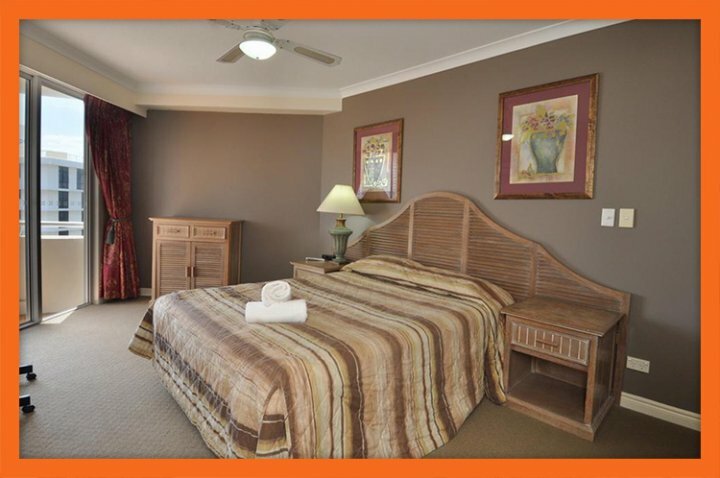 The master bedroom is equipped with a king bed and has its own private ensuite bathroom. The second bedroom contains a queen bed while the third bedroom contains two single beds. The main bathroom is shared between the second and third bedrooms. The second bedroom also has direct access to the balcony. The tariff for Apartment 123 is for 6 people. 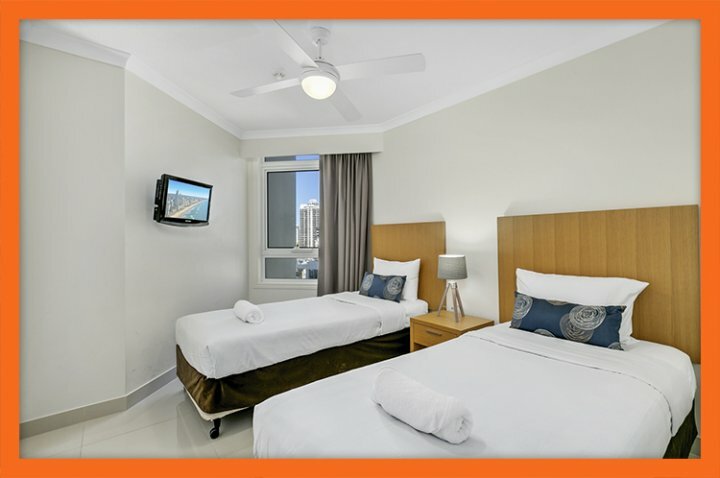 However, you can accommodate 2 extra guests in the apartment by requesting for extra beds at the time of your booking, which is available at a small surcharge. Resort Facilities Moroccan Resort is a 4 star holiday resort, which offers world class facilities and amenities. Should you choose to stay in Apartment 123, you will also have access to all resort facilities, which include secure underground parking, 3 magnificent swimming pools, two outdoor spas and an indoor spa, a BBQ area, a gymnasium, a games room, a tour desk and much more! 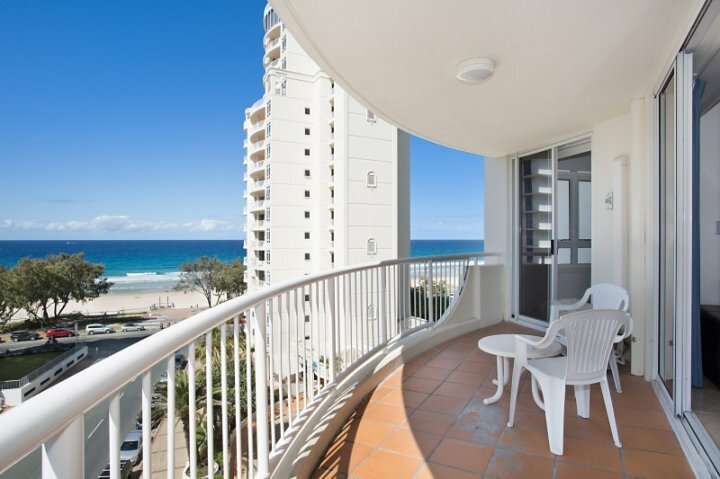 You cannot possibly expect more from accommodation in Surfers Paradise. 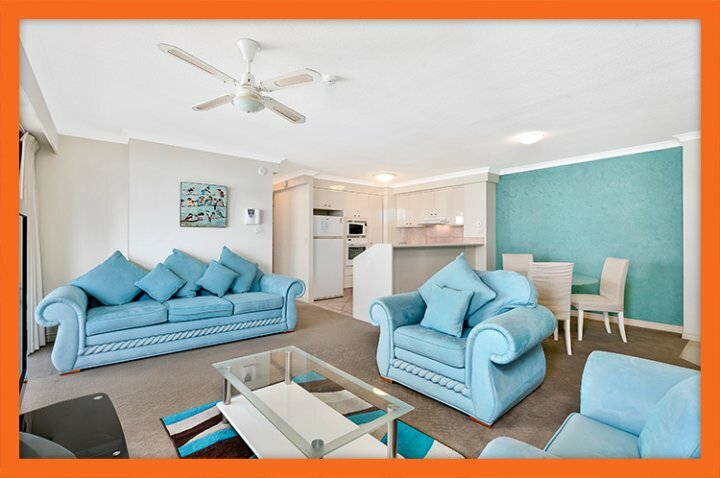 With striking apartments and great resort facilities, you should definitely consider Apartment 123 for your holiday. 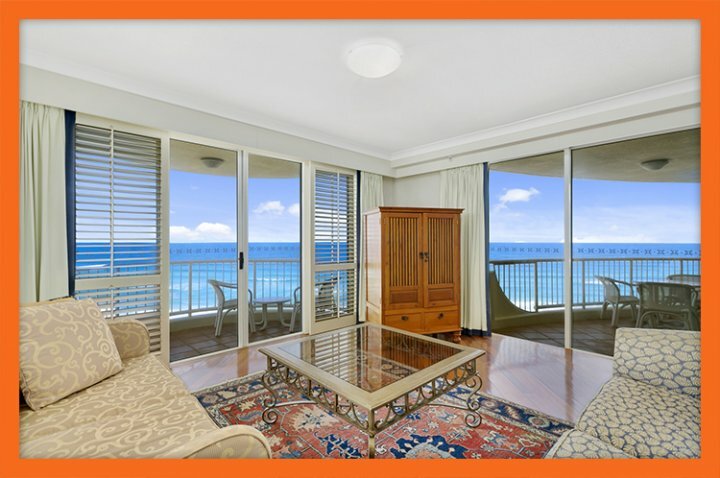 Apartment Overview For self-contained holiday accommodation that boast of location and luxury, look no further than Apartment 143 of the Moroccan Resort. 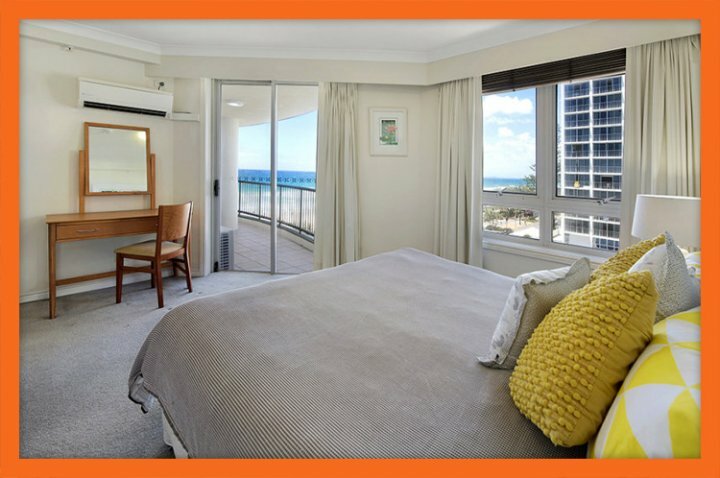 Located just 200mt from the beach, this well-appointed and fully air-conditioned apartment features 3 bedrooms and comes with free parking and Foxtel Premium. 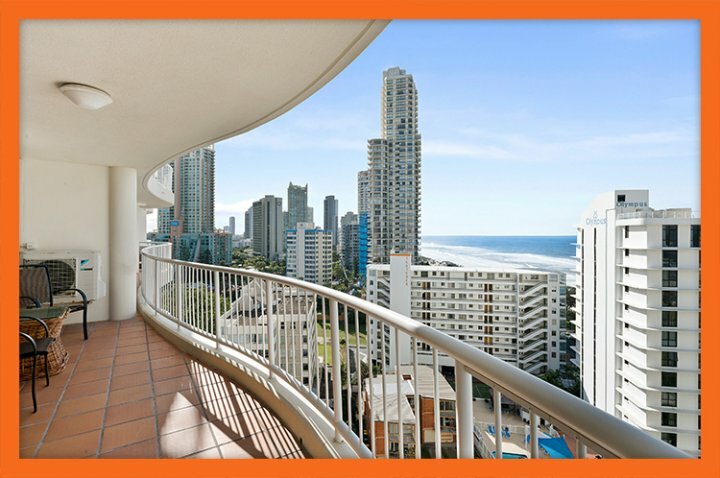 Apartment 143 is located on the 9th level of Moroccan Resort's Elkhorn Tower and offers North-Eastern views of Surfers Paradise Beach. 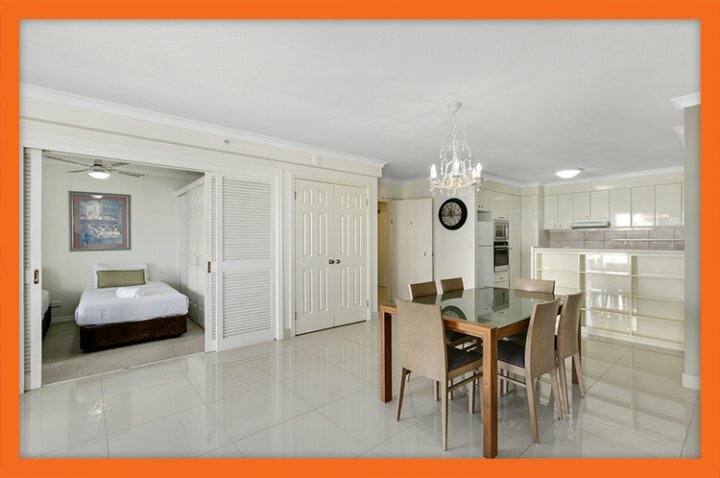 Apartment Features Apartment 143 offers ample space for 6-8 guests. With 3 bedrooms, it also contains two bathrooms, a full-size kitchen, separate dining and living area, a laundry and a large balcony to take in the views. 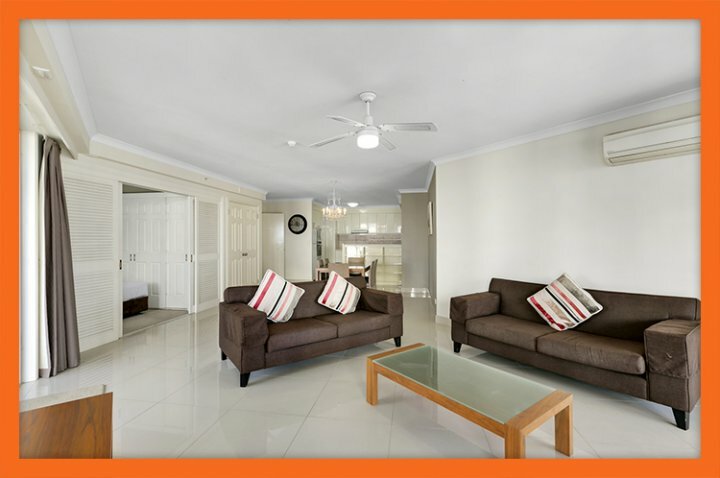 The large living area features a flat-panel TV (equipped with Foxtel Premium) and a DVD player. 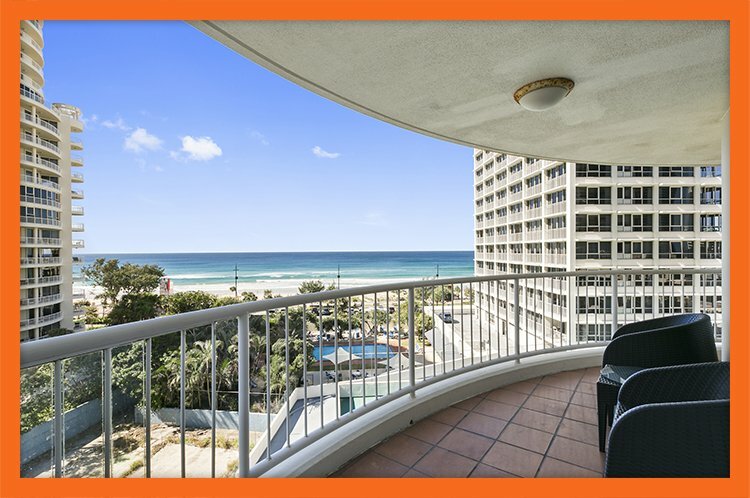 It provides access to the furnished balcony, which offers spectacular views of Surfers Paradise Beach and the Pacific Ocean Bedding Configuration This apartment has 3 bedrooms, which are well-sized. The master bedroom is equipped with a king bed and has its own private ensuite bathroom and walk-in-robe. The second bedroom contains a king bed, built-in-robe and balcony access while the third bedroom contains two single beds and built-in-robe. The main bathroom is shared between the second and third bedrooms. The tariff accommodates 6 guests. However, an additional 2 guests can be accommodated by requesting rollaway beds at the time of your booking (surcharge applies). Resort Facilities Moroccan Resort is a 4 star holiday resort, which offers world class facilities and amenities. Should you choose to stay in Apartment 143, you will also have access to all resort facilities, which include multiple swimming pools, an indoor and outdoor spa, secure underground parking, BBQ facilities, gym, games room and much more! 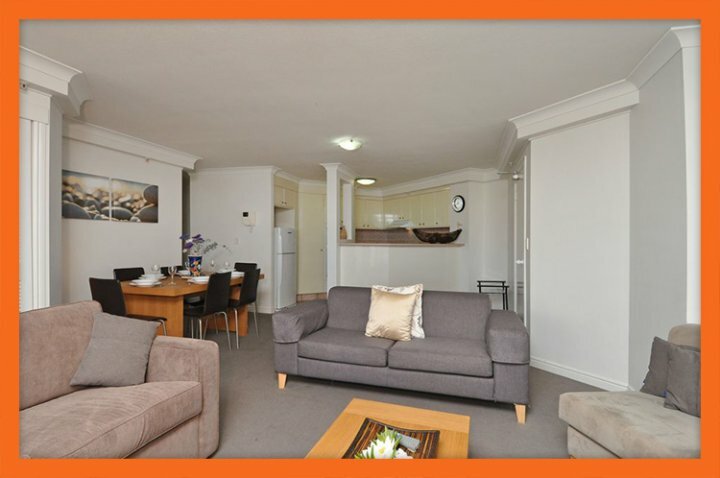 For accommodation that is all about location and luxury, you can't go past Apartment 143. Apartment Overview Moroccan Resort, Apartment 224 is one of our most sought after holiday apartments and you only have to look at the view to see why. 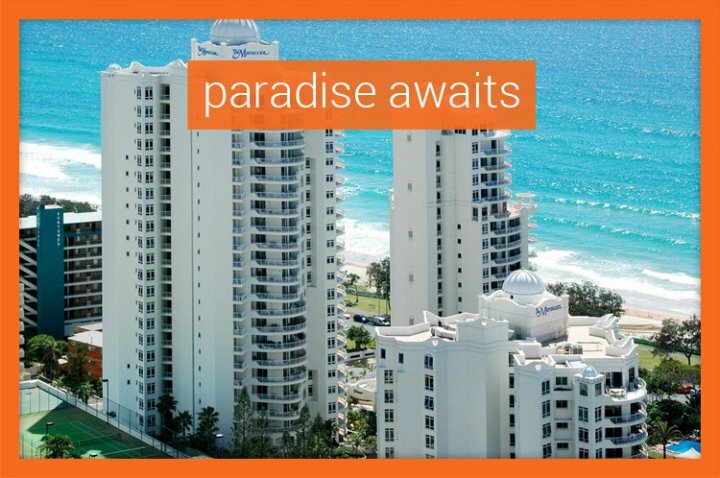 Escape to paradise and enjoy all the Gold Coast has to offer - in style. 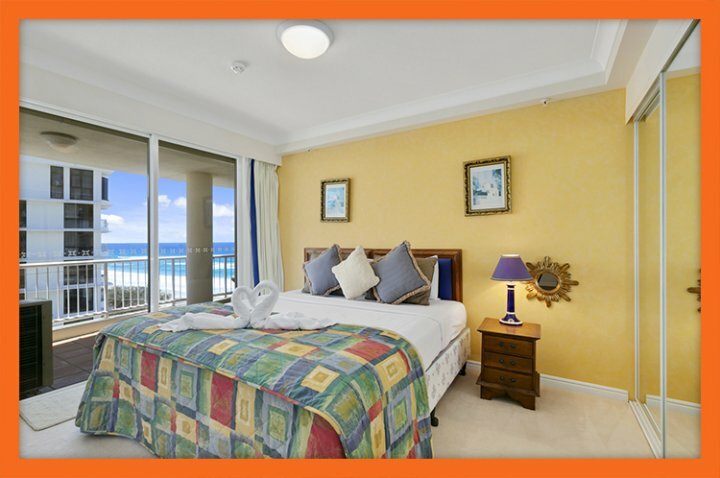 Boasting spectacular ocean views, this 3 bedroom 2.5 bathroom privately managed holiday apartment is what dreams are made of. 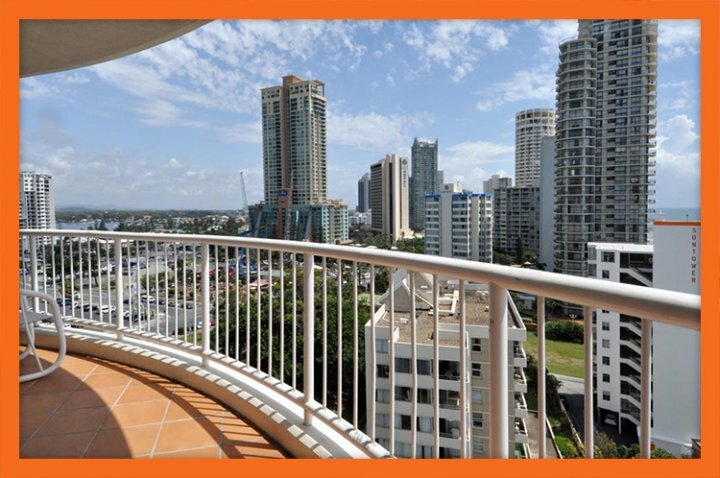 Located on the 6th floor of Moroccan Resort's View Tower, Apartment 224 is the perfect home-away-from-home for families or groups of friends visiting Surfers Paradise. Apartment Features Sleeping up to 8 guests (six included in the tariff), Apartment 224 offer comfort and luxury to its guests. 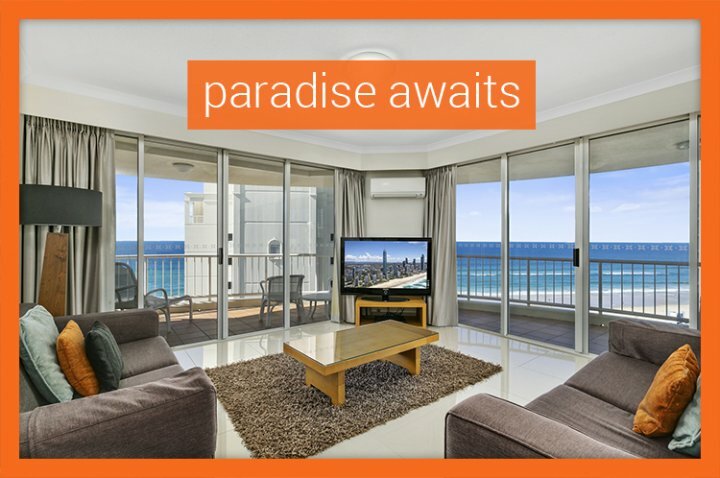 Relax on the large lounge and stare at the ocean, or chill out watching a DVD or the free premium Foxtel channels. 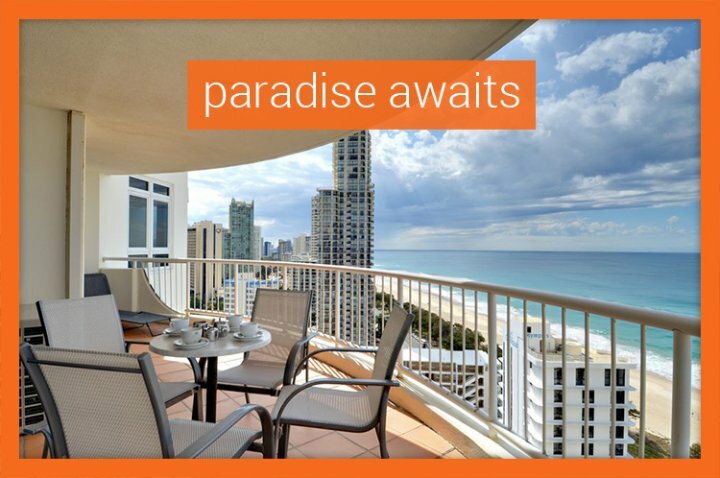 Spend your evenings unwinding with a glass of wine on the furnished balcony while you discuss the day's activities or cook up a storm in the full kitchen, which features a stovetop, oven, full size refrigerator and microwave. The apartment also has a separate dining area with a six seater table to sit and enjoy your meal. 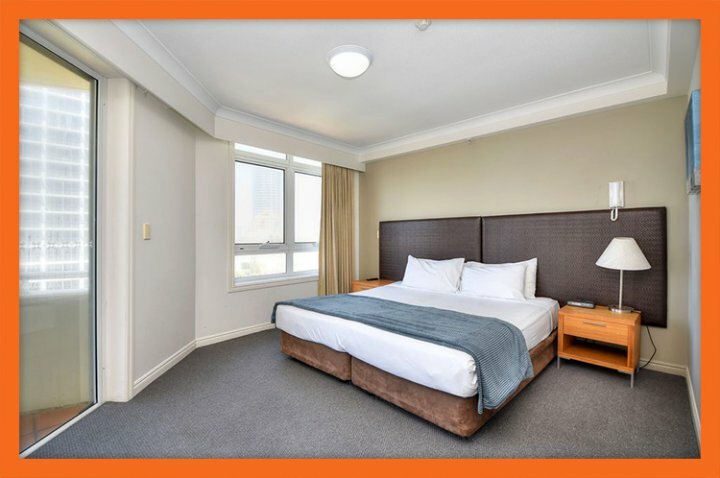 Additional features of this holiday apartment include free undercover car parking, a DVD player and stereo, full laundry facilities, smoke detectors and sprinkler system. All linen is supplied. 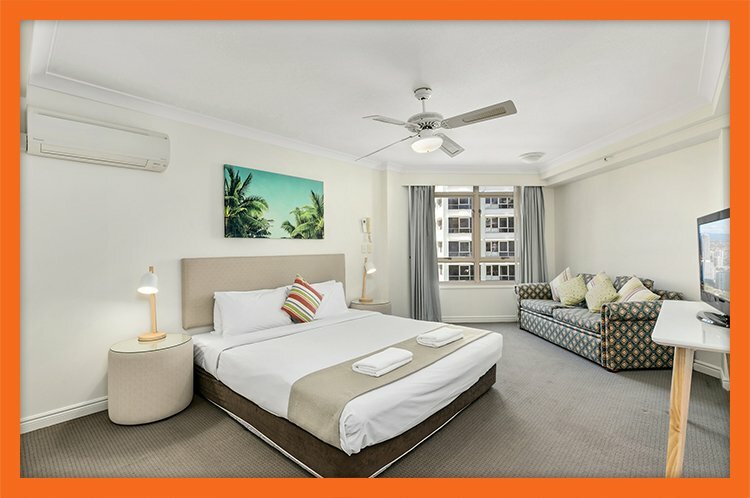 Bedding Configuration Taking your family on holiday can sometimes be challenging, but that won't be the case if you choose Moroccan Resort's Apartment 224 as your holiday accommodation. Its three bedrooms offer much needed personal space, and this is only amplified by the 2.5 bathrooms. 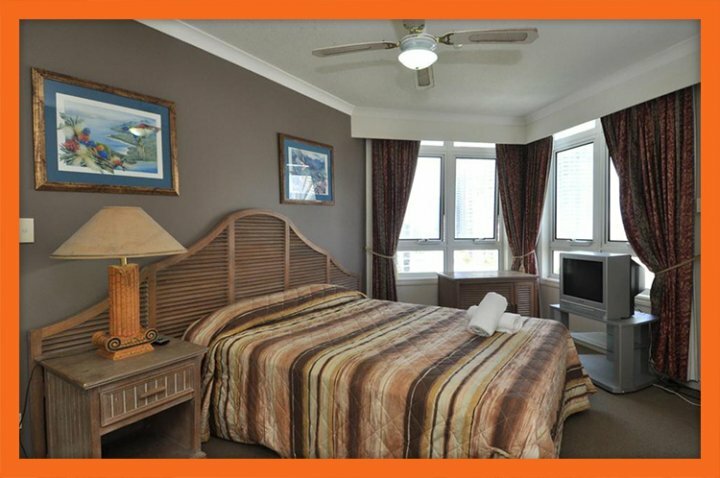 Retreat to the air-conditioned master bedroom where you'll find a queen bed, flat panel TV, balcony access and ensuite. 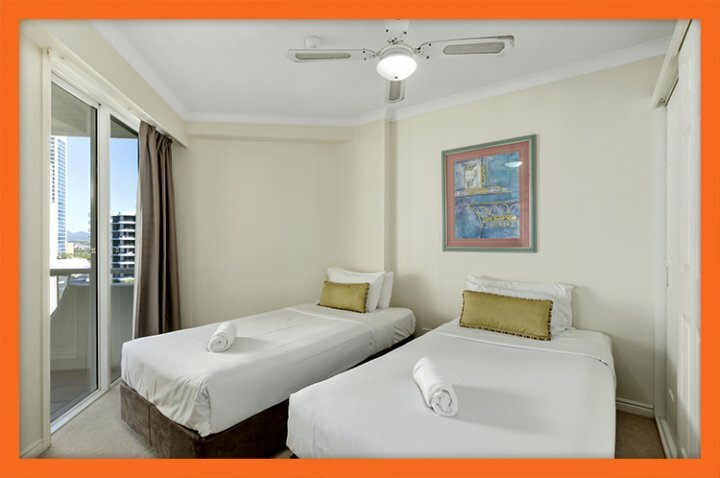 While your kids can choose between the second bedroom, which features a queen bed and the third bedroom, which has 2 single beds and direct access to the balcony. Each bedroom has built-in-robes and ceiling fans. 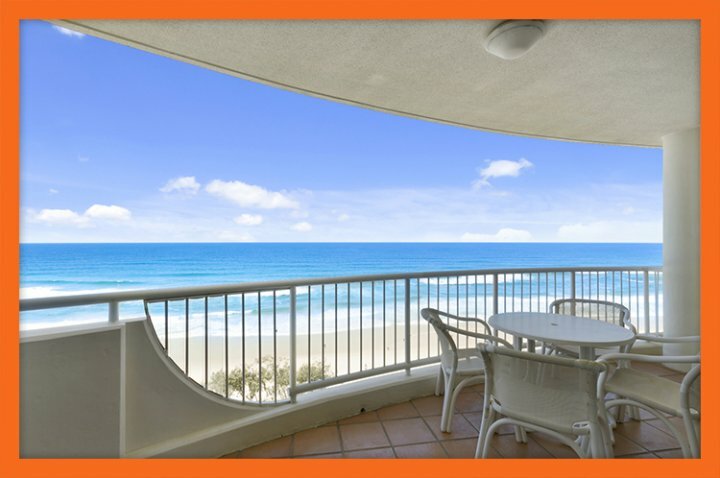 Spacious beach-side holiday accommodation doesn't get much better, certainly not at this price! 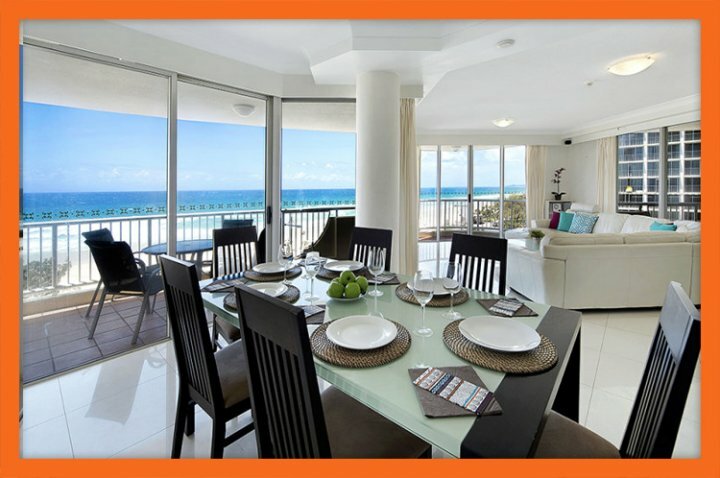 For a memorable family holiday, choose Moroccan Resort, Apartment 224 for your holiday accommodation. GCHR look forward to welcoming you and your family. Apartment Overview Moroccan Resort, Apartment 239 is a 3 bedroom holiday apartment that sleeps 6-8 guests. 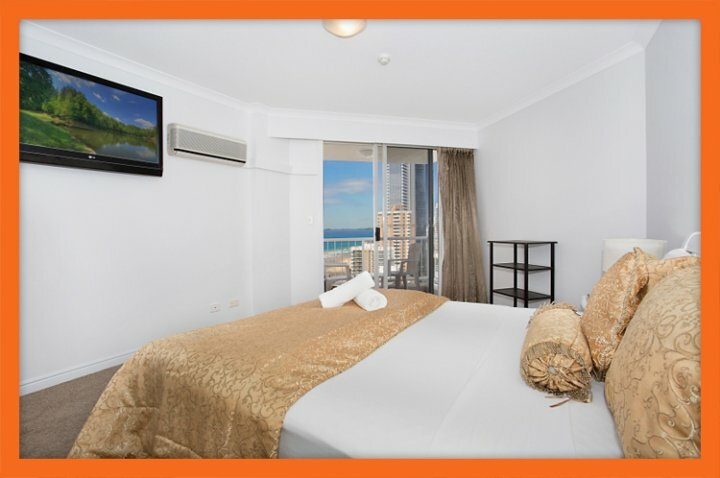 It is located right across from the beach and just 600 metres from Cavill Avenue. 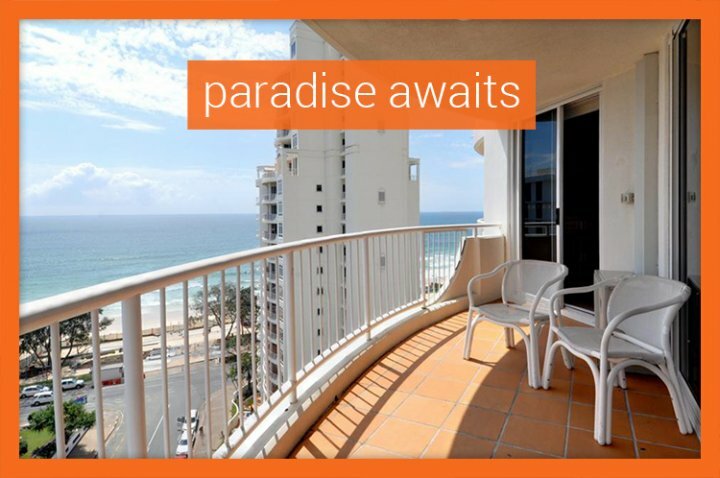 It is located on the 9th floor of Moroccan Resort's View Towers and is everything a Gold Coast holiday apartment should be. Boasting, an ideal location, spacious accommodation and a reasonable price, this popular apartment will be the highlight of your holiday. 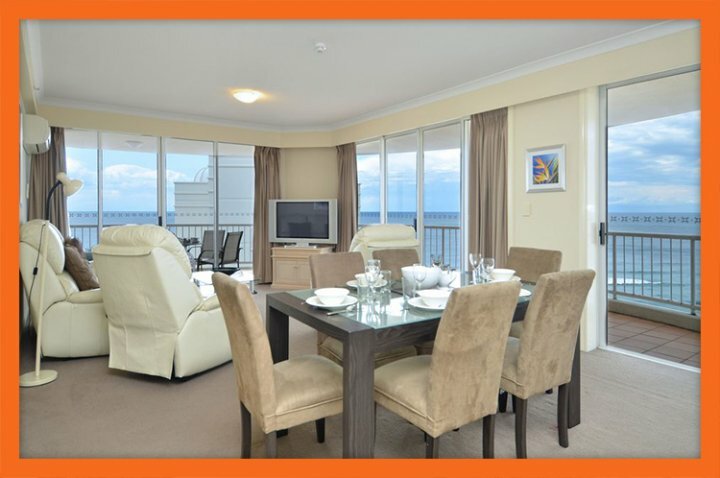 Apartment Features Apartment 239 is a fully self-contained holiday apartment that makes holidaying easy. It features a full kitchen, which is equipped with a refrigerator, stove, oven, microwave, dishwater, toaster and all utensils. It also features a laundry which a washing machine, dryer and ironing facilities. 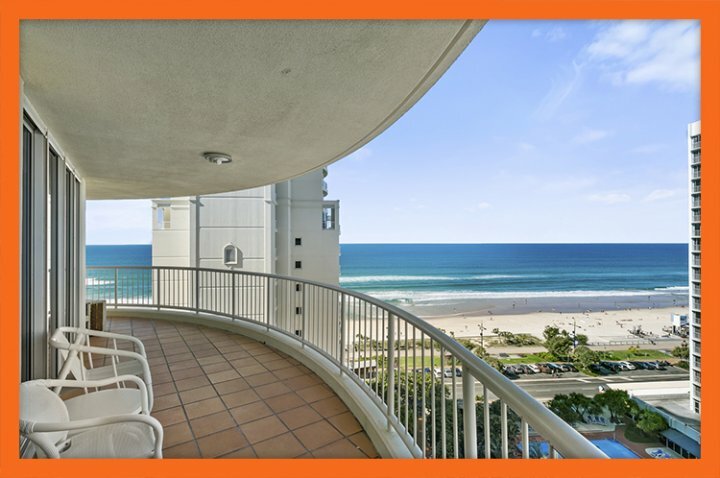 Additionally, the apartment features a separate dining and living area, spacious balcony that offers great ocean and city views and three bathrooms. A free car parking space is also provided throughout the duration of your stay. 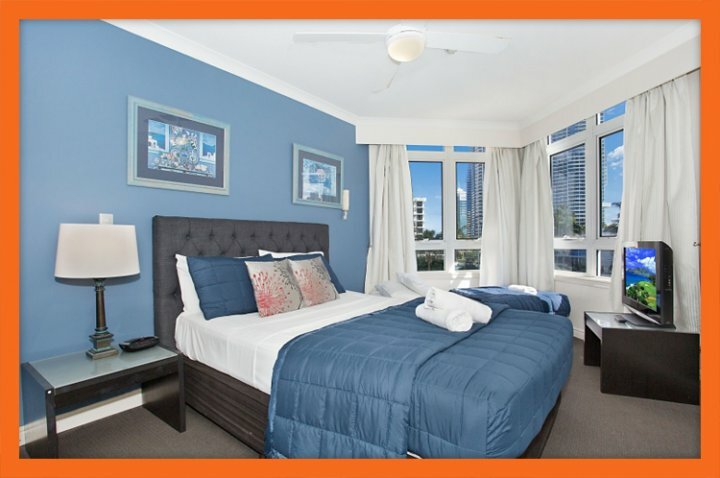 Bedding Configuration Apartment 239 features 3 spacious bedrooms. The master bedroom features a king size bed, walk-in robe and an ensuite bathroom. The second bedroom features two single beds and built-in robe, while the third bedroom also features two single beds and a built-in robe. 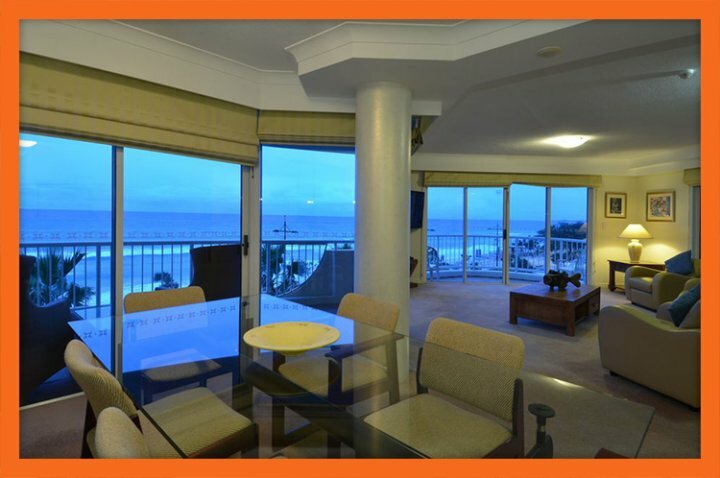 Each bedroom provides balcony access and great views of the ocean. The apartment sleeps 6 guests in the tariff, but it has the ability to sleep as many as 8 guests for a small additional fee. Simply place your request for a rollway bed(s) during the booking process. Resort Facilities The Moroccan Resort is an AAA 4 star rated resort. As such, if offers guests a plethora of facilities, which you have full access too. The resort features two pools one indoor and one outdoor, two spas again one indoor and one outdoor, a sauna, a barbeque area, a great games room, a gymnasium, a tour desk and business facilities. 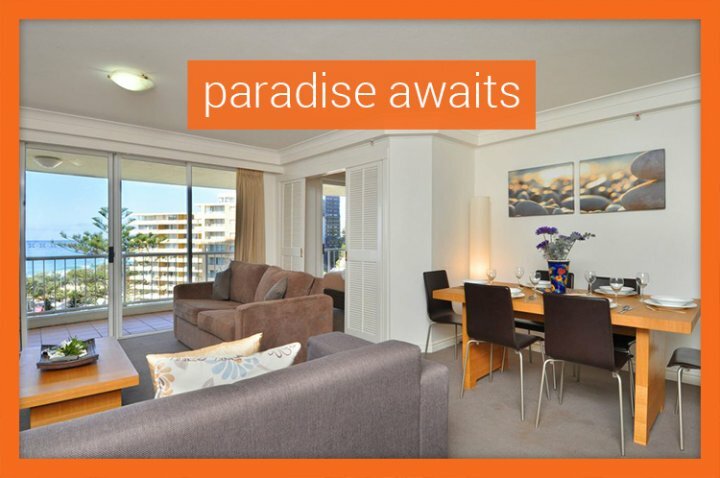 Place yourself in the heart of Surfers Paradise just metres from the beach. This is one holiday apartment you CAN afford! Book your stay today. 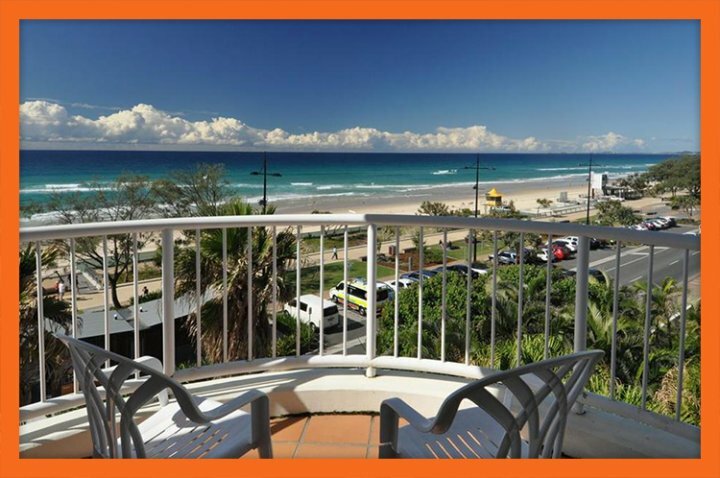 Apartment Overview For luxury holiday accommodation that is located just 200 metres from the beaches of Surfers Paradise, Apartment 252 of the Moroccan Resort is an ideal choice. 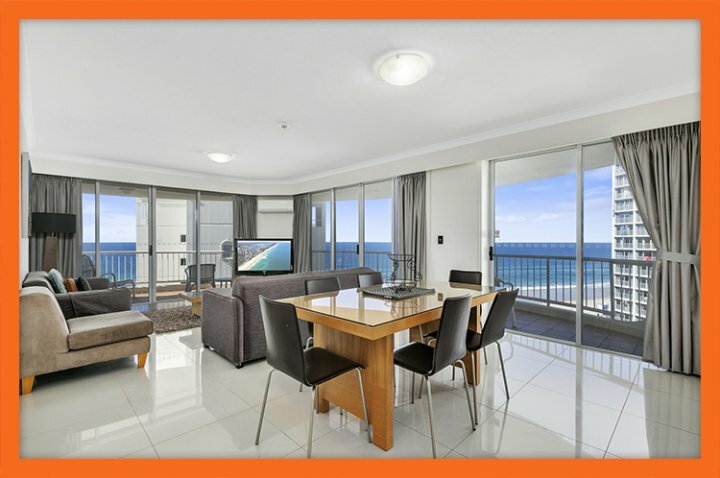 It offers a great location, loads of space, ocean views and affordable rates, making it perfect apartment for families holidaying on the Gold Coast. 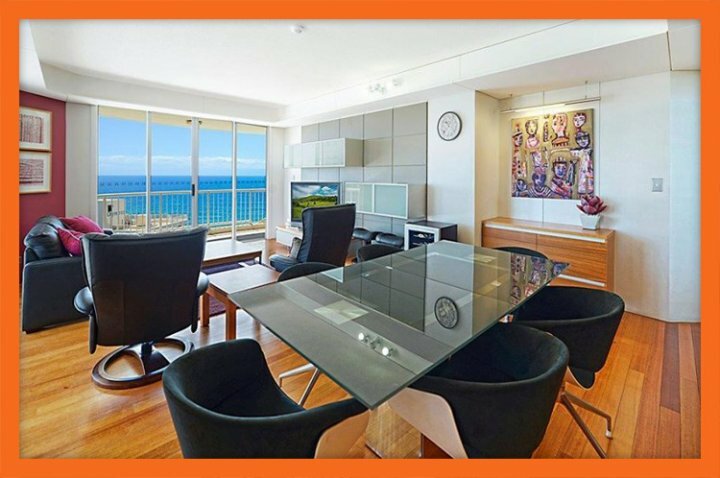 Apartment 252 is located on the 12th floor of Moroccan Resort's View Towers and is just 600 metres from Cavill Avenue. It features 2 bedrooms and 2 bathrooms and is ideally suited for small families of 4-6 members. Apartment Features Apartment 252 features all the comforts of home. The apartment features a separate and fully-equipped kitchen and laundry, dining area, spacious balcony and living area. 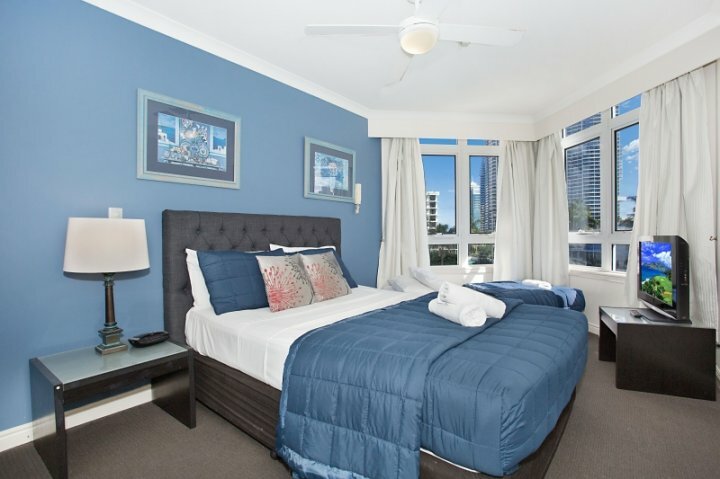 There are two bedrooms, each which offer great views of the Pacific Ocean and Gold Coast city as well as two bathrooms - one of which is an ensuite to the master bedroom. 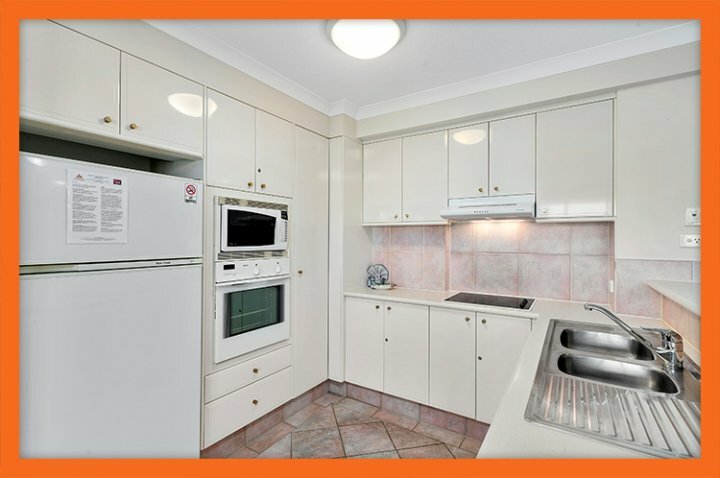 The kitchen an laundry mean you can enjoy a home cooked meal and wash your clothes, while the living area offers the perfect place to relax and watch a DVD on the flat panel television after a long day exploring the sites of the Gold Coast. A free parking space is also provided with each booking. 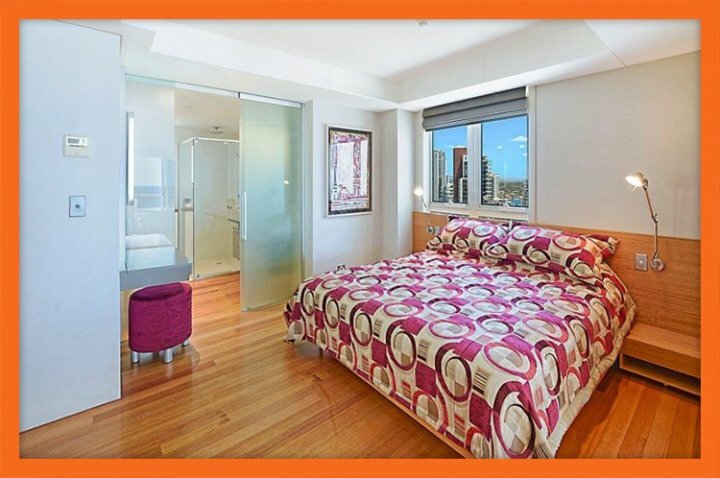 Bedding Configuration Apartment 252 consists of 2 bedrooms. The master bedroom contains a queen size bed and features a walk-in robe, private balcony and an ensuite bathroom. The second bedroom contains two single beds and a built-in robe. It also provides access to the main balcony. The apartment's tariff sleeps 4 guests however 2 additional guests can be accommodated on rollway beds for a small additional fee. Simply place your request when booking the apartment. 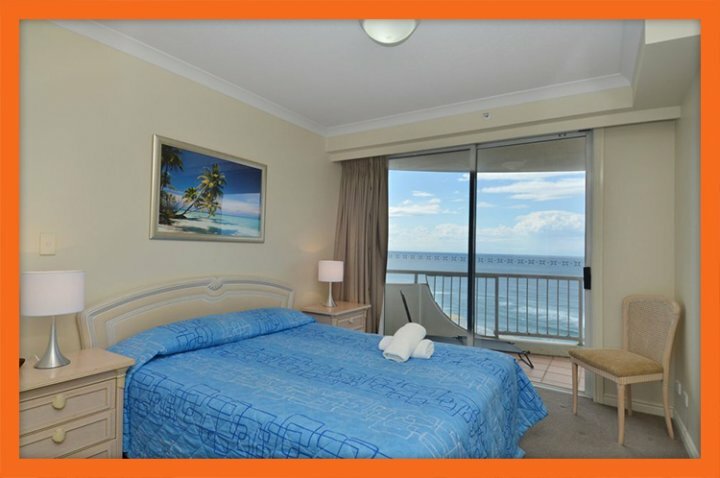 Resort Facilities Apartment 252 is managed privately by GCHR.com.au however all guests still have full access to the facilities of the resort. 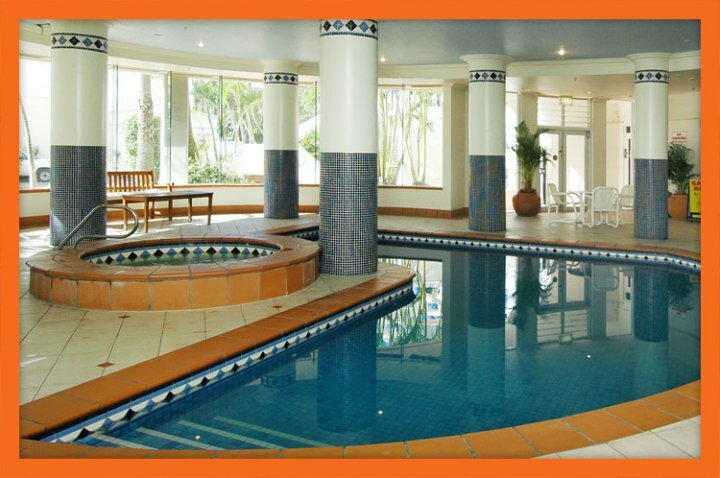 Such facilities include indoor and outdoor heated pools and spas, a sauna, gum, games room, BBQ area and much more. For a family holiday where you're accommodation is just as good as the destination itself, choose to stay in Apartment 252 of the Moroccan Resort. 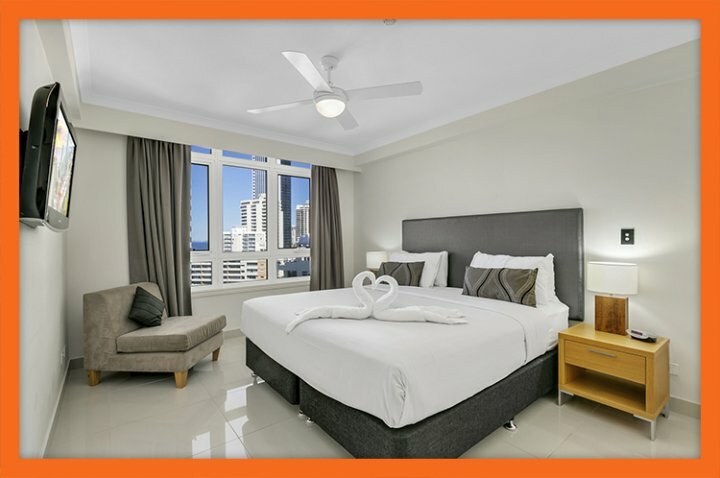 Apartment Overview If you're looking for high quality, yet affordable accommodation in Surfers Paradise, you just can't beat Apartment 269 of the Moroccan Resort. 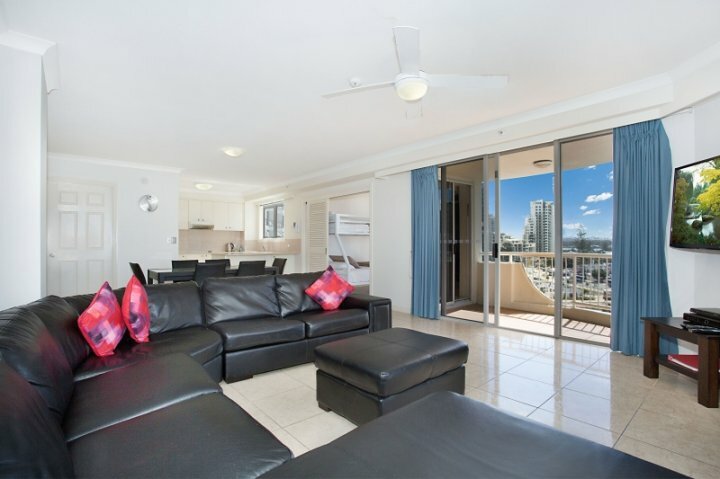 This modern apartment lies in walking distance from the lively Esplanade and the amazing Surfers Paradise Beach, while still offering you a peaceful and relaxing atmosphere. 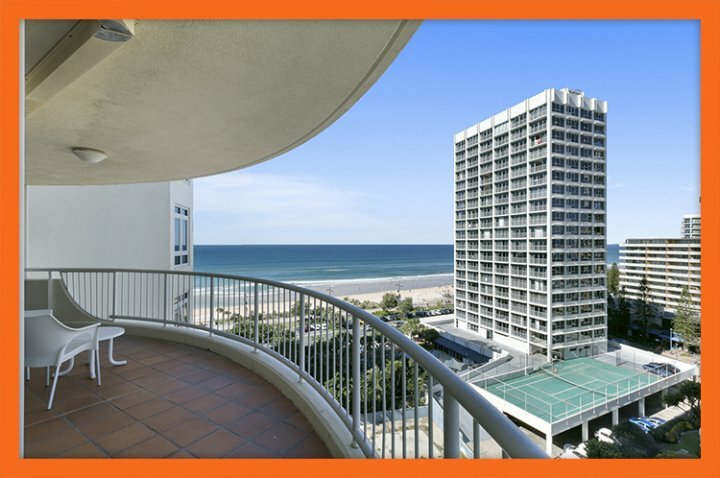 Apartment 269 lies atop the 16th level of Moroccan Resort's View Tower and it offers remarkable views of the golden beaches and the Esplanade. Perfectly suited for a couple on a romantic getaway or a small family, this apartment consists of 2 bedrooms and 2 bathrooms. 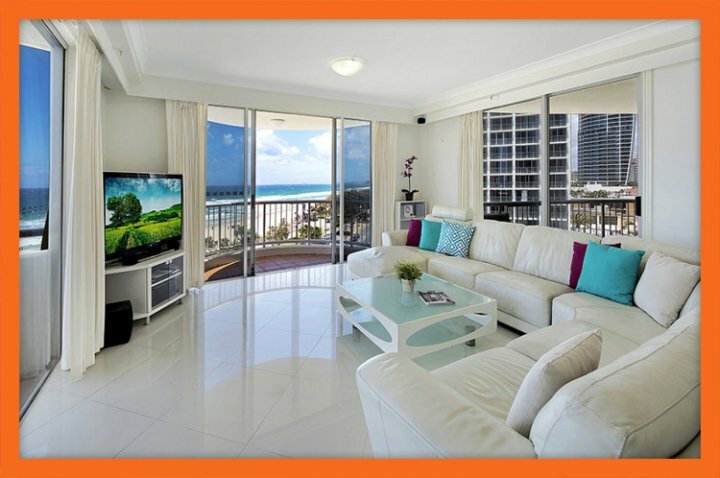 Apartment 269 will certainly add glamour to your Gold Coast holiday experience. 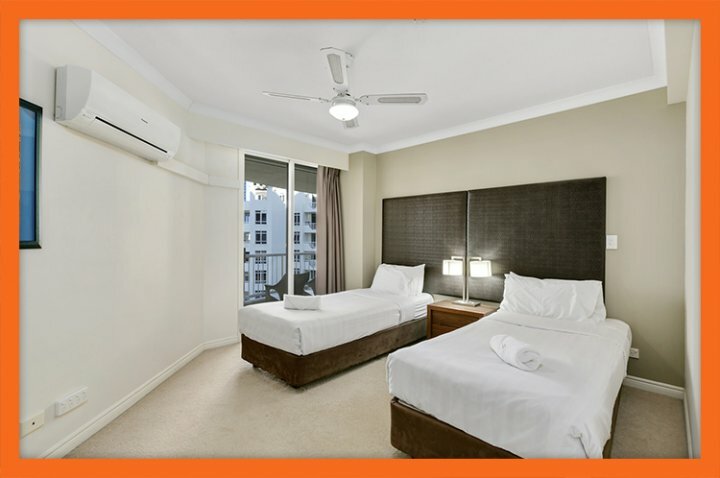 You will be hard-pressed to hard to find accommodation in Surfers Paradise that offers the same value that Apartment 269 delivers. Apartment Features An apartment designed to reflect a true holiday ambiance Apartment 269 is packed with everything that you need to enjoy a rich holiday experience. 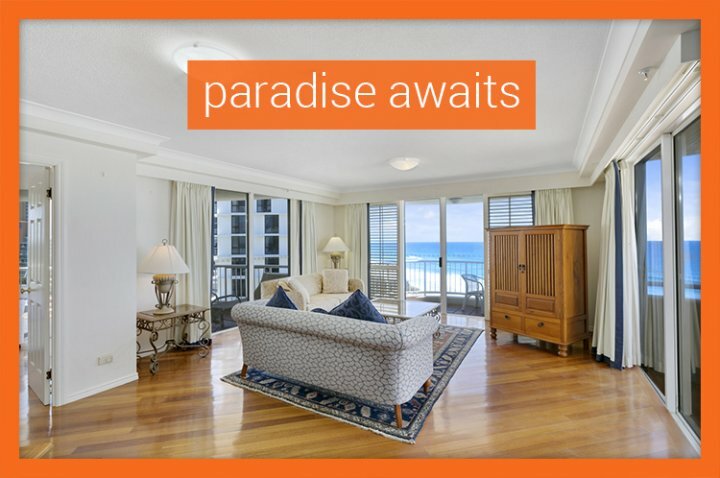 Featuring polished timber floors, a spacious living area which opens out to a balcony with breath-taking views, a fully equipped gourmet kitchen and a dining area for 6, this apartment provides superb facilities for a memorable holiday. 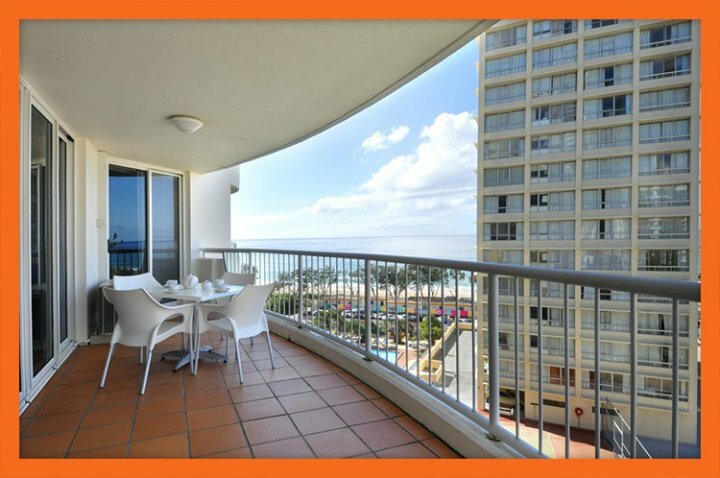 Meals can also be had on the balcony, which is equipped with an outdoor table and chairs. While the kitchen allows you to cook your own meals, you can relax in the living room which contains various entertainment options. This apartment is sure to be loved by one and all. Free parking is also including in your booking. 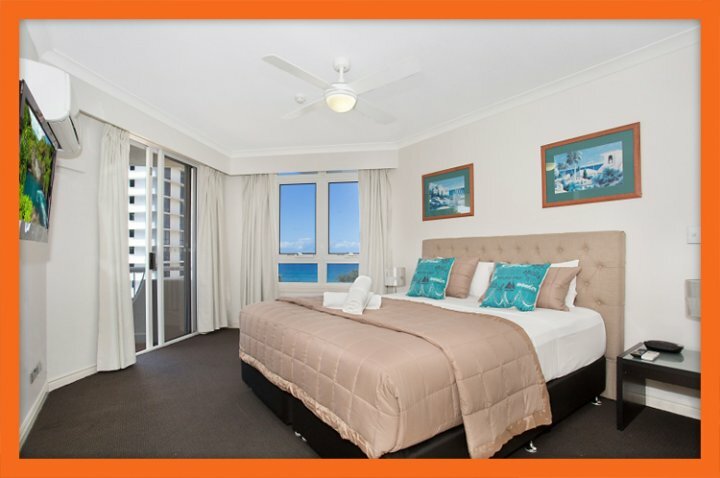 Bedding Configuration Apartment 269 features two smartly designed bedrooms, which offer you both convenience and repose on your holiday. The master bedroom is equipped with a queen bed and a private ensuite bathroom and also contains a TV set and a walk in robe. The second bedroom consists of two single beds. The tariff for Apartment 269 sleeps up to 4 guests. Resort Facilities A truly world class resort, Moroccan Resort offers you all the facilities that you could wish for. Whether you're a family or a couple on a holiday, you will definitely enjoy the grand spas, saunas and the swimming pools that the resort has to offer. A gymnasium, games room and poolside entertainment area are some of the other highlights of the resort. A gated resort, with top class security features, Moroccan Resort makes your holiday a safe and enjoyable experience. 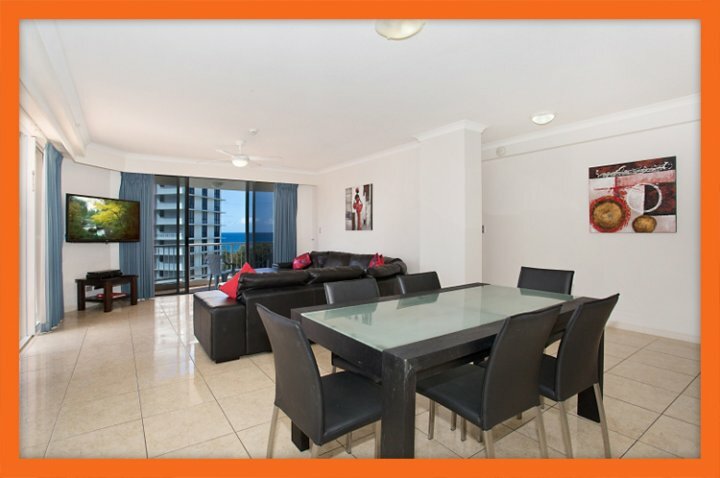 To enjoy a wonderful beachfront holiday, you can find no better accommodation in Surfers Paradise that of Apartment 269. 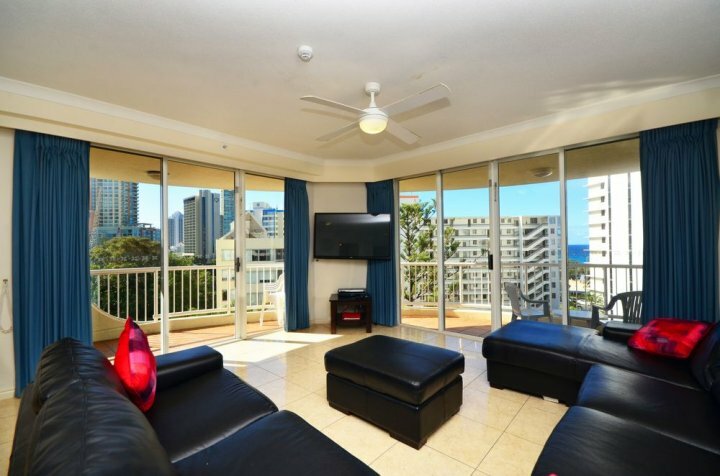 Apartment Overview If you're planning a Surfers Paradise holiday, then you can do no better than booking beachfront accommodation, such as that of Moroccan Resort's Apartment 286. 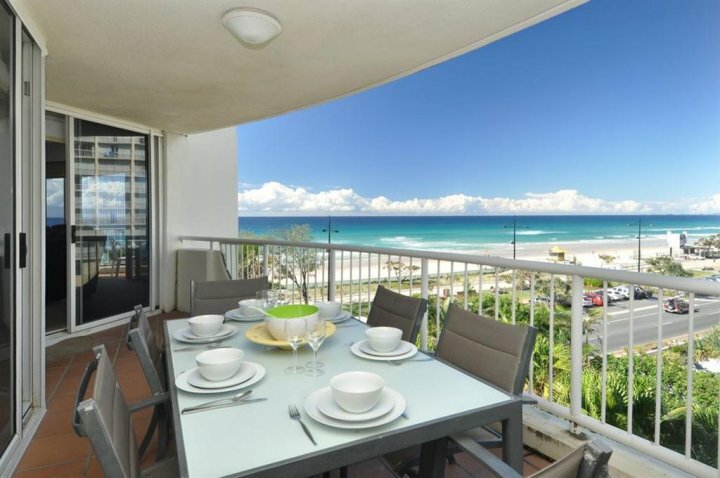 This Surfers Paradise holiday apartment lies right next to the Esplanade, and the amazing beach is just a stroll away. 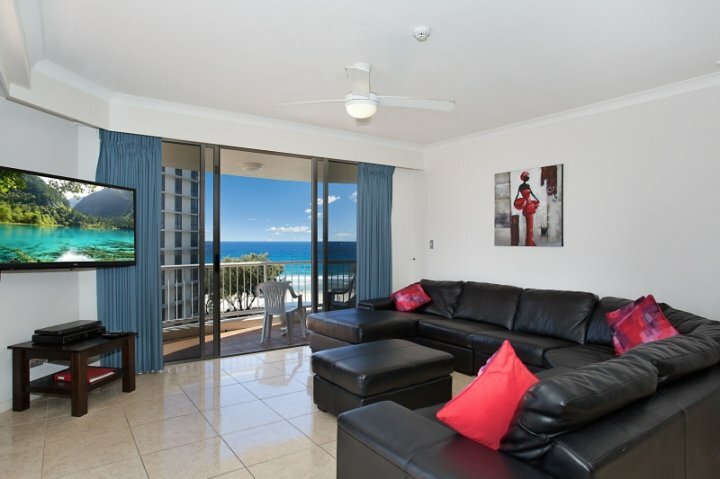 While it may lie in the middle of all the action, Apartment 286 still offers a peaceful atmosphere for a relaxing Gold Coast holiday. 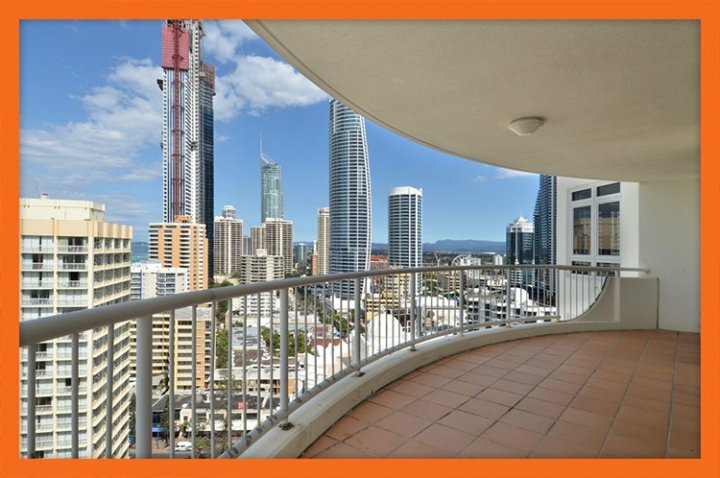 Situated on the 19th level of the View Tower at the Moroccan Resort, this majestic 3 bedroom apartment will ensure that you get nothing but the best from your Surfers Paradise accommodation. 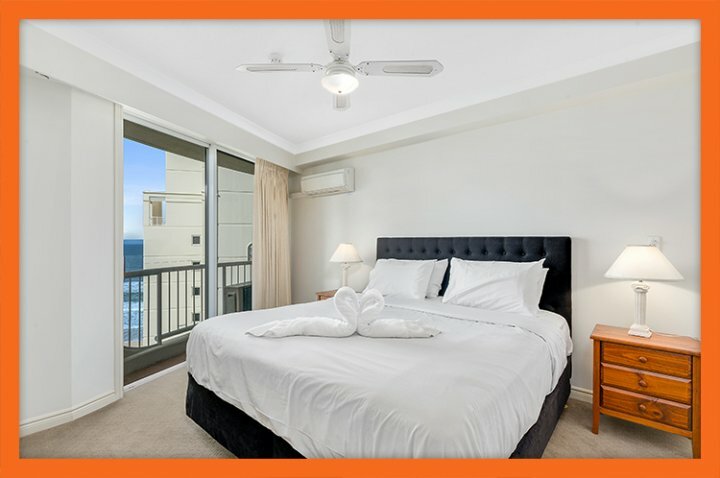 Featuring 2 bathrooms and boasting of quality features and world class facilities, Apartment 286 is just perfect for a Gold Coast family holiday. 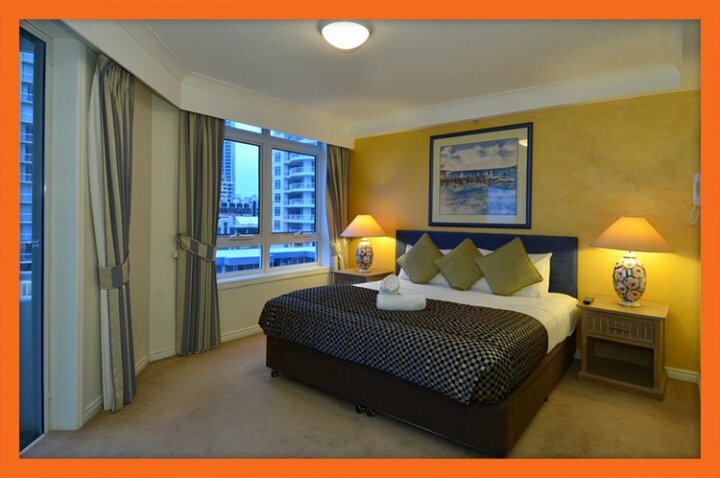 Apartment Features A magnificently designed apartment, Apartment 286 will make your holiday experience all the more enjoyable. 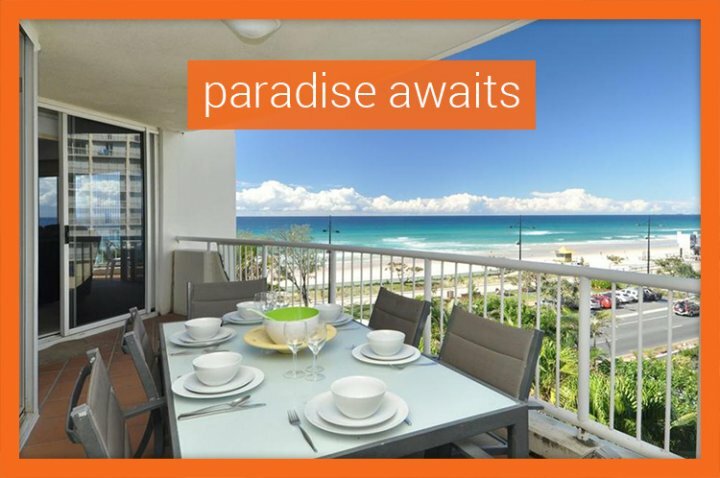 This apartment boasts of an immaculate living area connected to a terrace balcony which has outdoor tables and chairs set up for you to enjoy the grand views of the ocean. The living area also includes various entertainment options for you to delight in, including free unlimited WiFi and free Premium Foxtel. 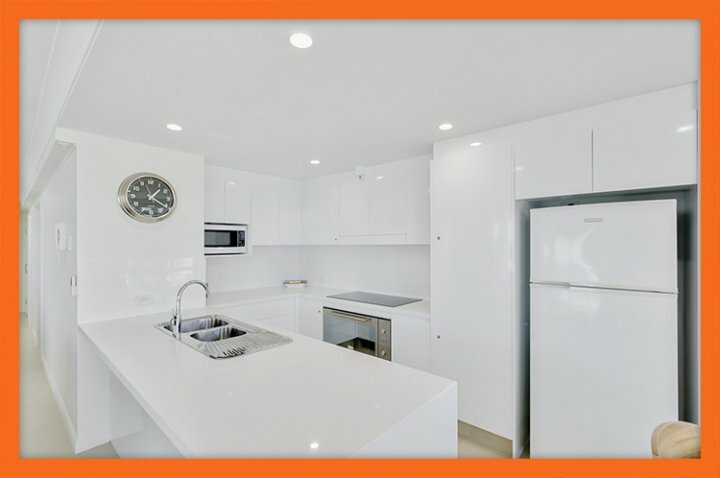 The apartment's fully-equipped gourmet kitchen allows you to enjoy home cooked meals on your holiday. You can have your meals either in the spacious dining area, which seats 6 people, or you can choose to have an alfresco dining experience out on the balcony. Free parking is also included with your booking. Bedding Configuration All three bedrooms of the apartment feature a sublime design and are classy as well as comfortable. Queen beds are provided in both the master bedroom and the second bedroom, while the third bedroom contains two single beds. The master bedroom also includes a TV set and an elegant private ensuite bathroom. 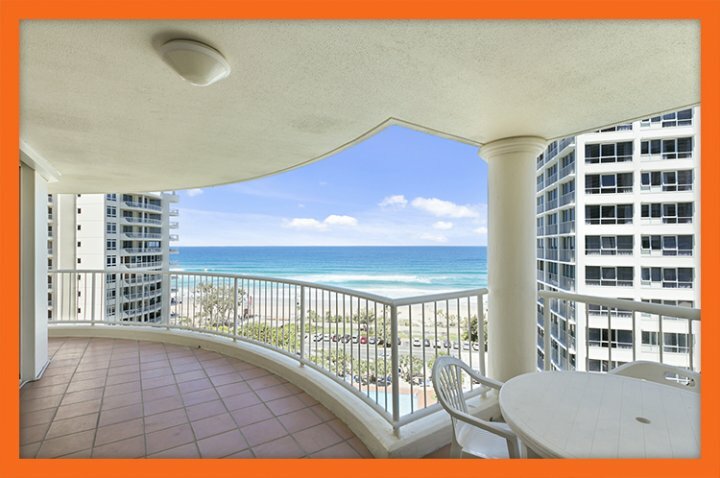 All three bedrooms face the east and offer captivating views of the beaches and the ocean. The tariff for Apartment 286 includes 6 people but it is spacious enough to accommodate 2 extra guests. You can request for two foldaway beds at the time of booking to sleep two guests, which will be provided at a small additional fee. Resort Facilities Moroccan Resort is a world class resort, which is packed with various facilities for you to luxuriate in. You can pamper yourself in the swimming pools, spa or sauna or you can enjoy getting a relaxing tan out in the gardens. Poolside BBQ areas, a games room and a gymnasium are other things to look forward to from this resort. 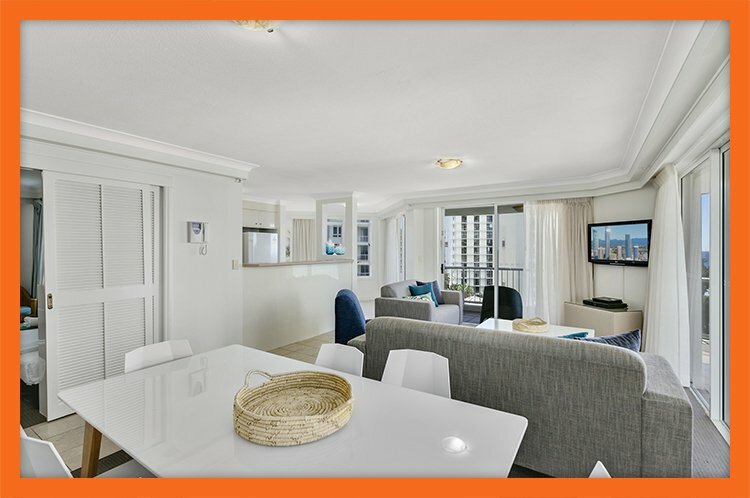 Surfers Paradise holiday accommodation does not get any better than Apartment 286 at the Moroccan Resort. 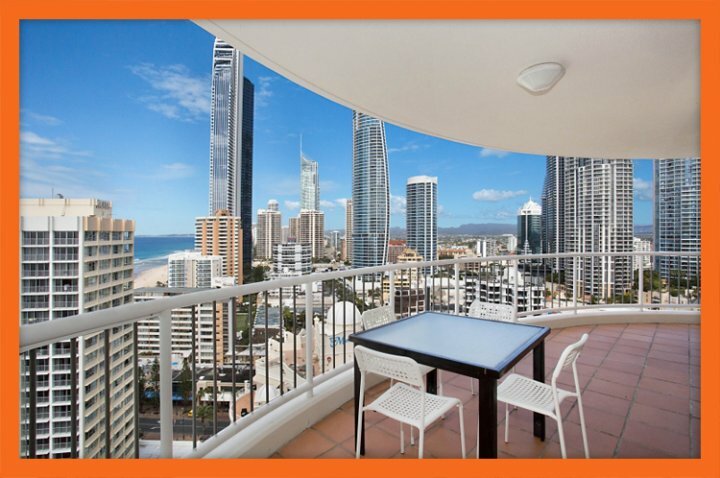 Apartment Overview Surfers Paradise accommodation does not get any better than Apartment 287 at the Moroccan Resort. 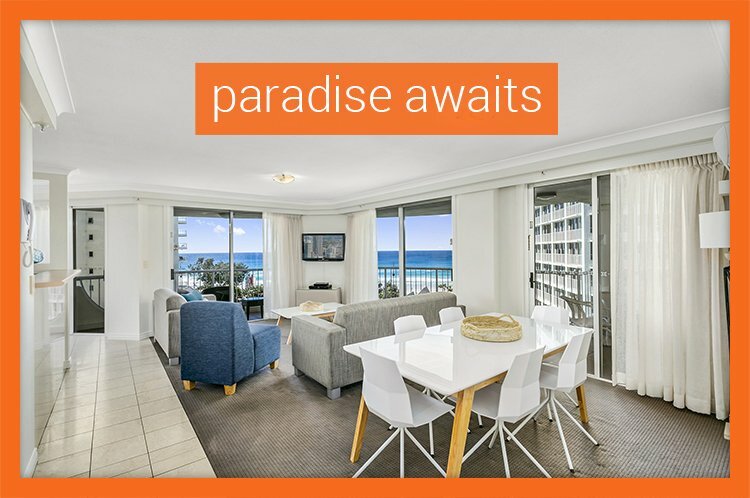 A beachfront apartment which lies within walking distance from the Esplanade and the beach, Apartment 287 is a sophisticated and well-designed apartment which will definitely offer you a pleasurable and relaxing Gold Coast holiday experience. A 3 bedroom apartment with 2 bathrooms, Apartment 287 sits atop the 19th level of Moroccan Resort's View Tower. 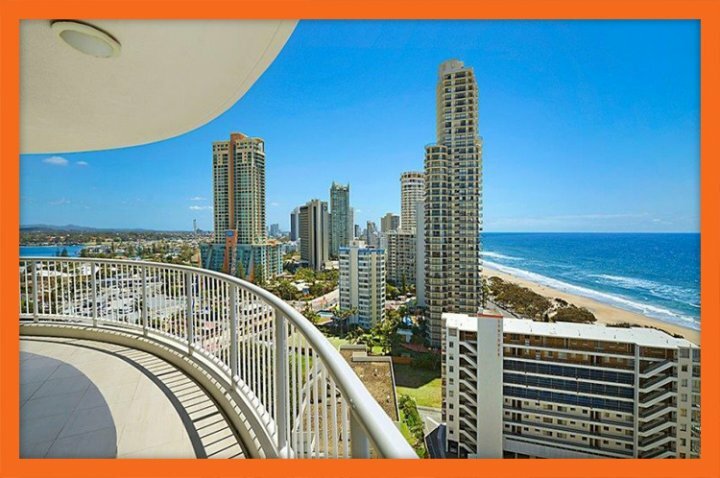 This east facing apartment, which offers divine views of Surfers Paradise beaches and the Pacific Ocean, boasts of nothing but the best. 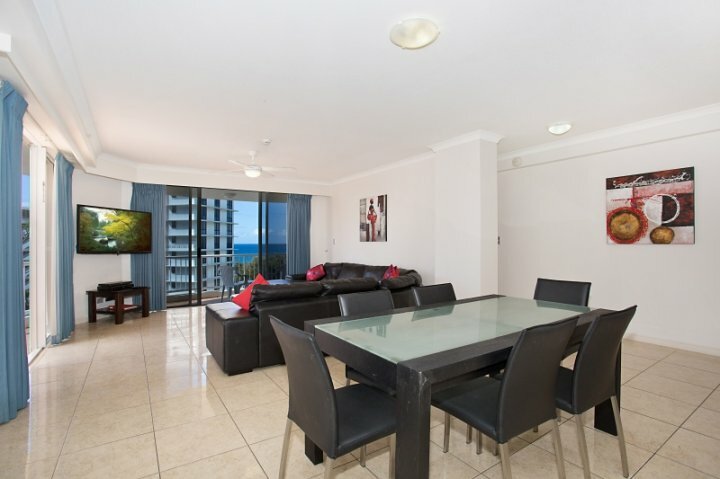 The apartment is ideal for a large family or even two small families looking to enjoy a holiday in Surfers Paradise. 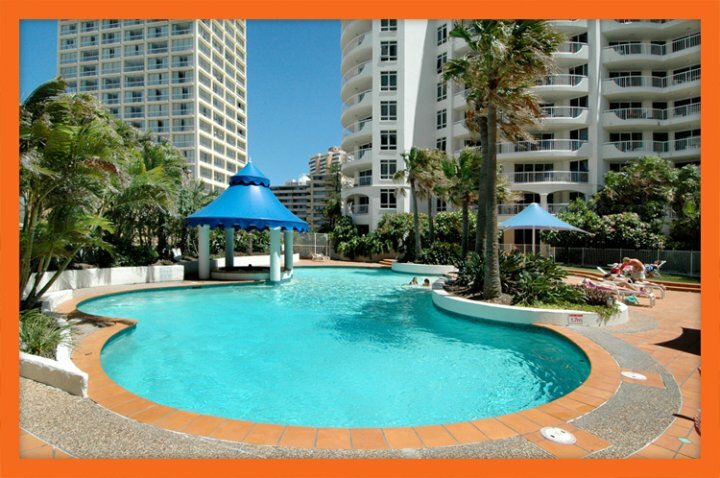 For luxury Surfers Paradise accommodation, Apartment 287 is indeed, very affordable. 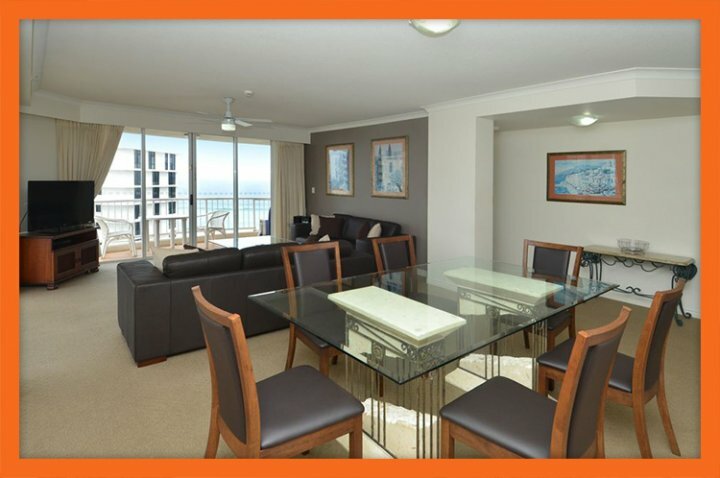 Apartment Features Apartment 287 offers world-class facilities to make your holiday all the more enjoyable. A spacious apartment with refined interiors, Apartment 287 contains a large living area, which consists of a lounge, a gourmet kitchen and a dining area. 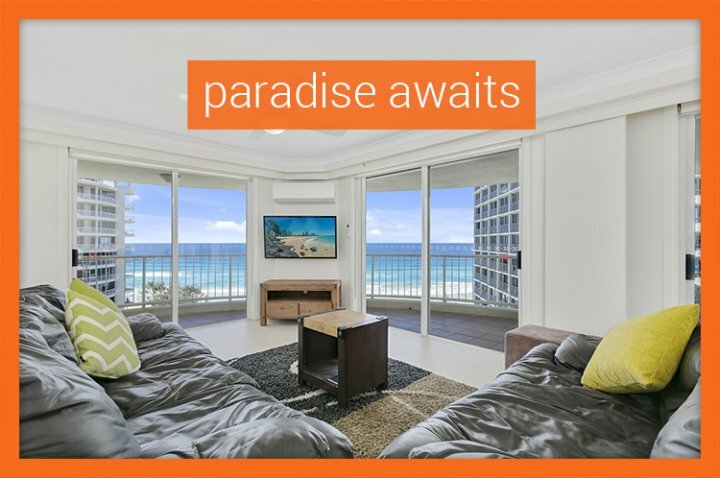 The living area is also connected to the terrace balcony, where you can revel in spectacular views of Surfers Paradise. 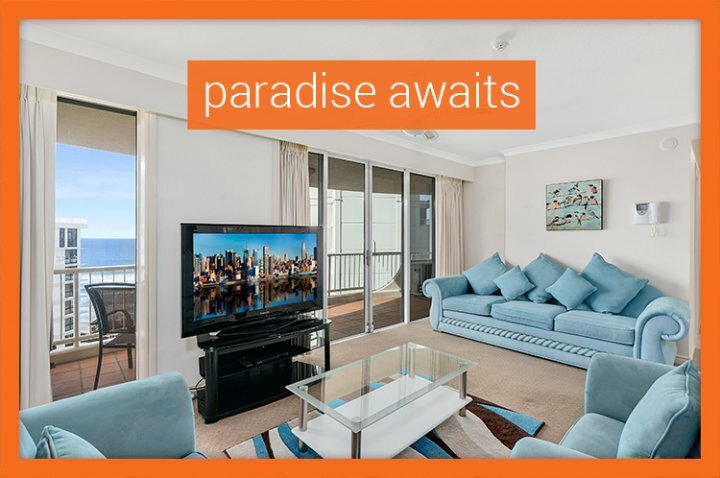 Several entertainment systems are also provided in the living area, including free Foxtel Premium. This apartment offers some serious cost savings. 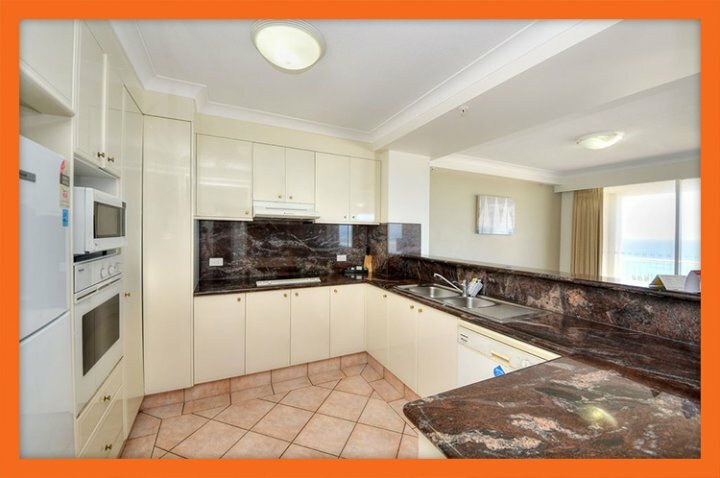 While the apartment itself is offered at a competitive price, you can make more savings on your holiday by choosing to cook your own meals, which thanks to the gourmet kitchen is a breeze. 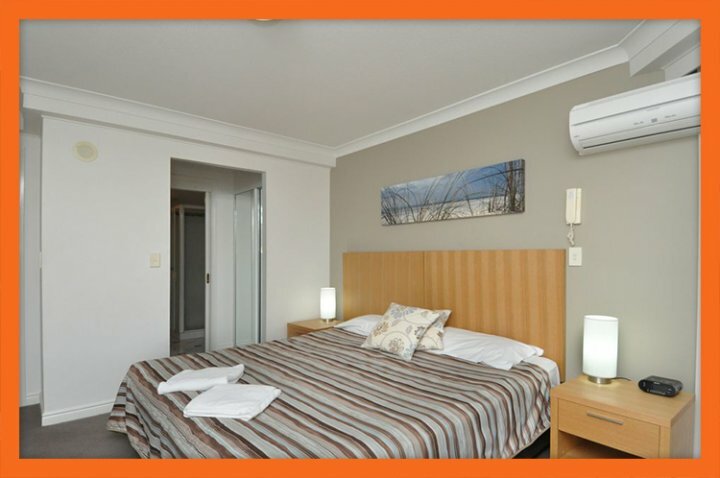 Laundry facilities are also provided, so you needn't spend anything extra. Free car park is also provided with your booking. 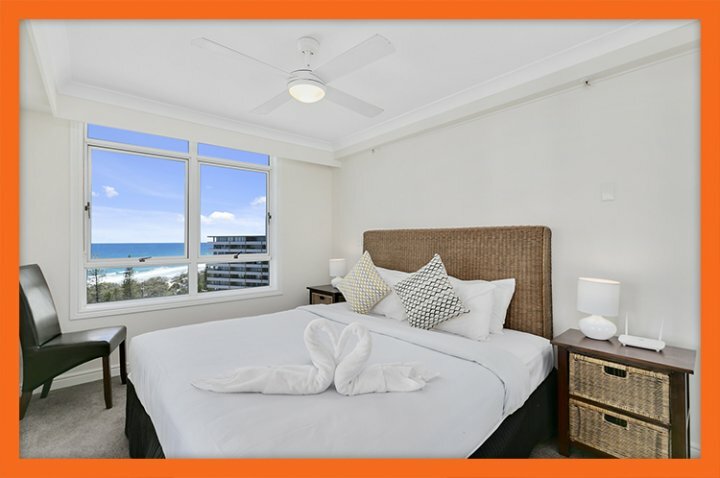 Bedding Configuration All 3 bedrooms of Apartment 287 are styled to perfection and offer spectacular views of the Gold Coast beaches and the Pacific Ocean. The master bedroom and the second bedroom both contain queen beds, while two single beds are provided in the third bedroom. 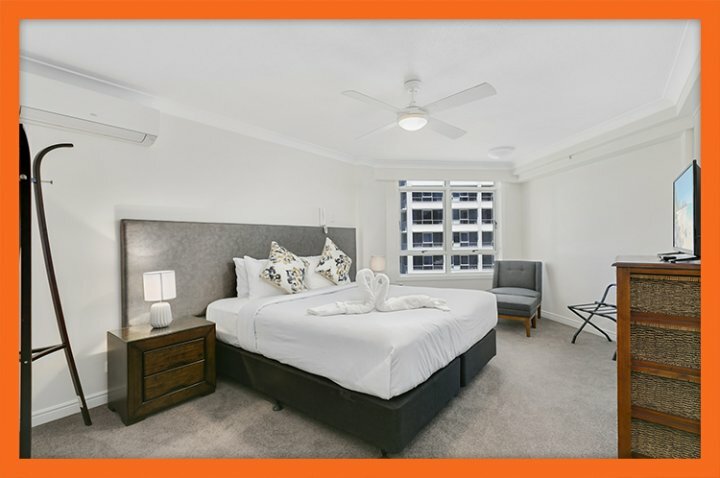 A private ensuite bathroom and a TV set add to the elegance of the master bedroom and the second bedroom enjoys direct access to the main balcony. The tariff for Apartment 287 includes 6 guests. However, you can choose to accommodate 2 extra guests by requesting for foldaway beds at the time of your booking - at a small surcharge fee. 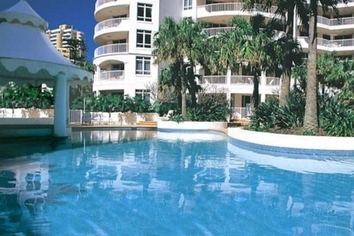 Resort Facilities Rated as a 4 star holiday resort, the Moroccan Resort perfectly complements a Gold Coast holiday. 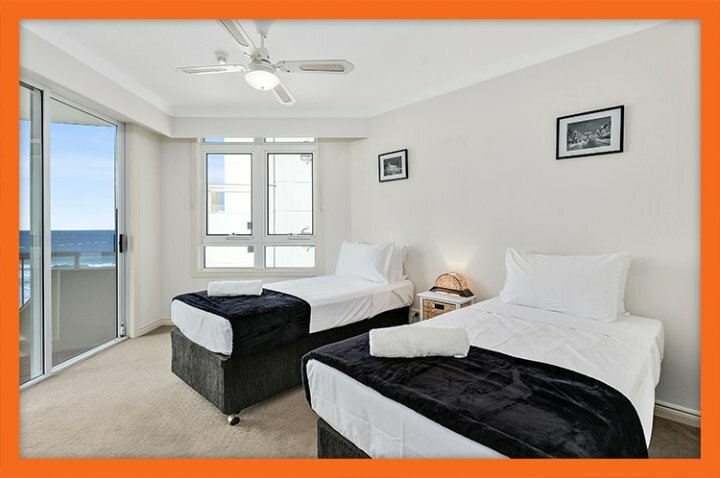 Should you choose to stay in Apartment 287, you can also spoil yourself enjoying a day in the swimming pools, or relaxing in the sauna or the spa. 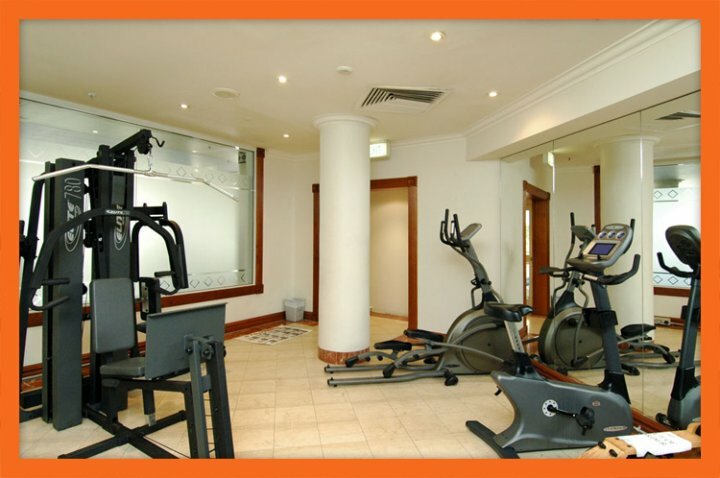 If you're a health enthusiast, you'll appreciate the gymnasium, while kids will definitely love the games room of this resort. 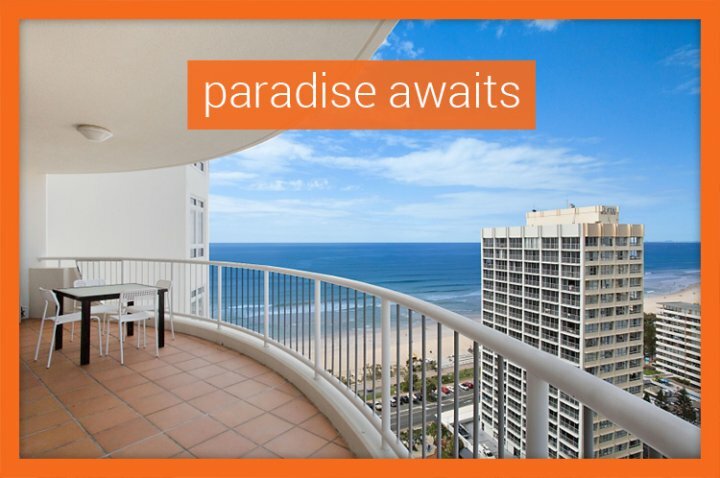 For a truly rich holiday experience, book your Surfers Paradise accommodation at Apartment 287. Apartment Overview Apartment 313 is located on the 6th level of Moroccan Resort and features 3 bedrooms, two bathrooms, and a powder room. 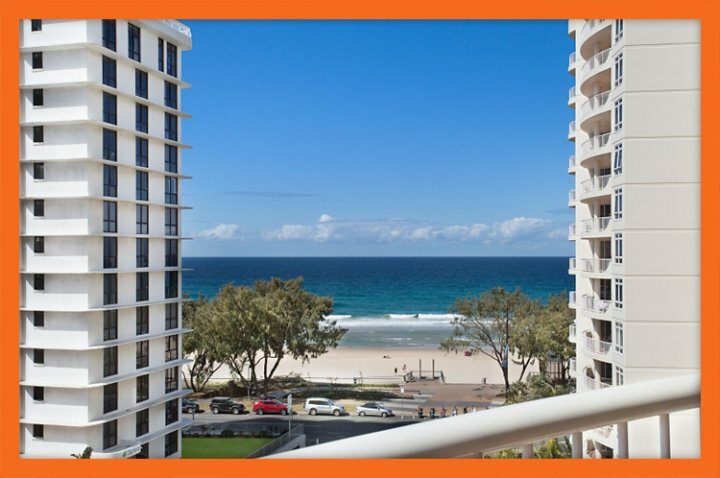 It is east-facing and offers spectacular beachfront views of the Pacific Ocean and is just a short walk from the heart of Surfers Paradise. 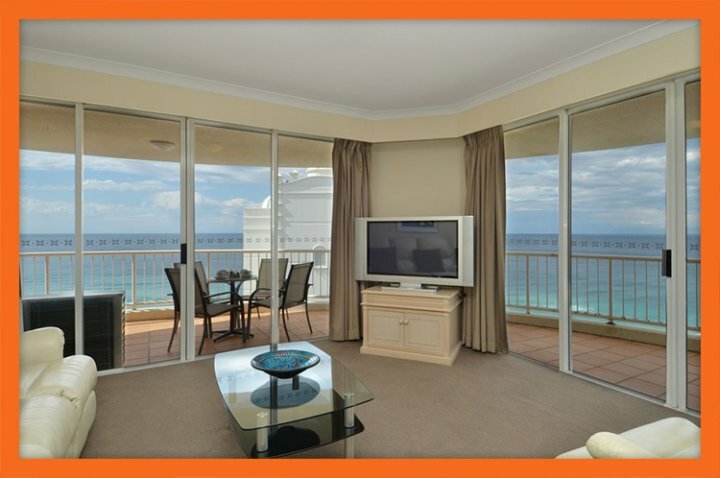 This luxurious holiday apartment sleeps 6-8 guests and is available at a very affordable rate. 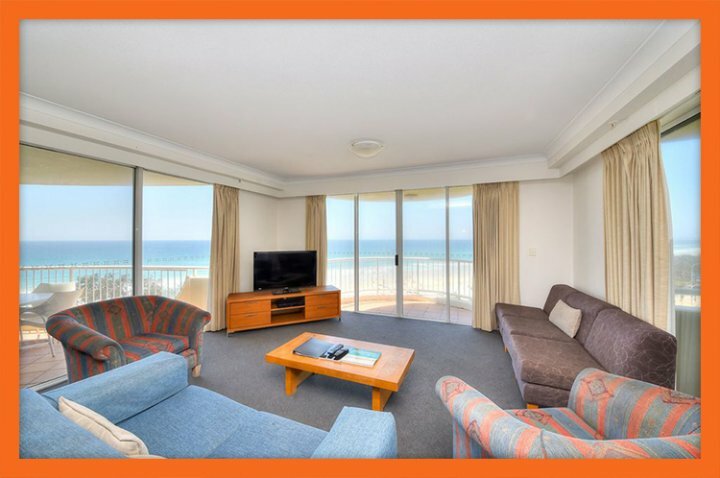 Apartment Features Apartment 313 is a spacious self-contained holiday apartment that is ideal for families or groups visiting the Gold Coast. It features separate living and dining areas, a full-size kitchen which is fully-equipped with all appliances, utensils, and dinnerware, and a laundry which features a washer/dryer and ironing facilities. The apartment is fitted with air-condoning and features a TV and DVD player, a large furnished balcony, granite kitchen and marble bathrooms, an en-suite bathroom and much more. A free parking space is also provided with each booking. 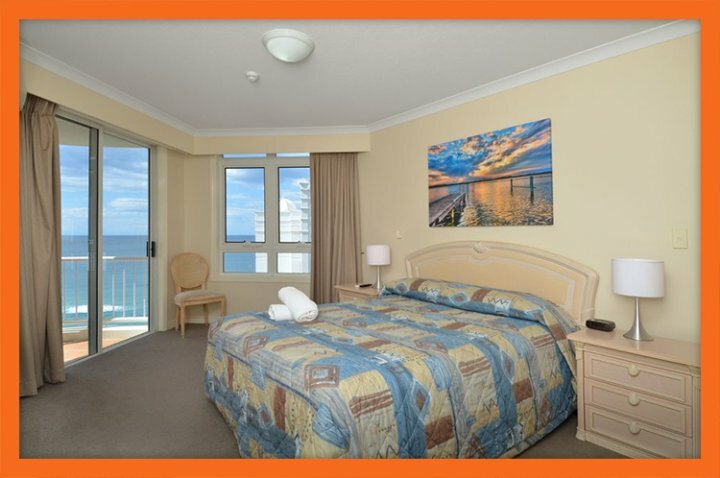 Bedding Configuration Apartment 313 offers three spacious bedrooms that are designed to meet the needs of all travel groups. A king bed is provided in the master bedroom, the second bedroom contains a queen bed and two single beds are provided in the third bedroom. The master bedroom also includes an en-suite bathroom, while the second and third bedrooms share the main bathroom. 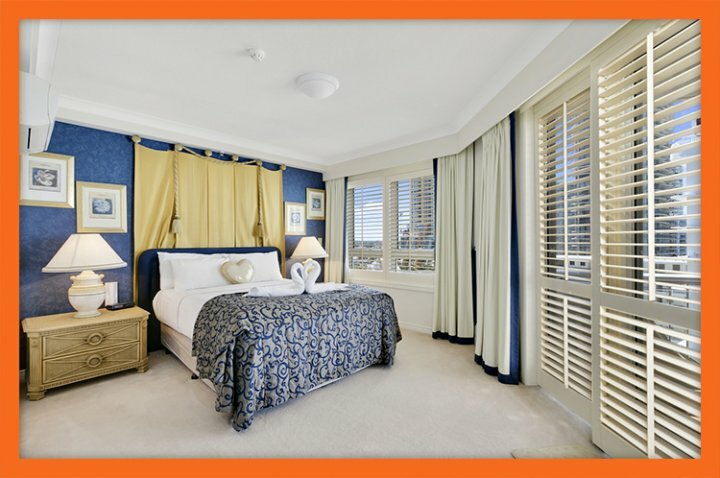 All bedrooms enjoy direct access to the balcony and contain walk-in robes as well. The tariffs are for 6 guests but the apartment can sleep as many as 8 guests for a small additional fee. Simply place a request for one or two rollaway beds during the booking process. 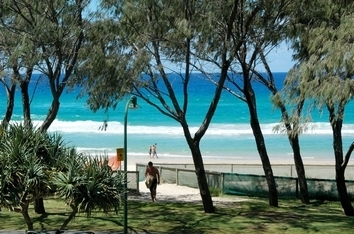 Resort Facilities Moroccan Resort is one of the Gold Coast most popular and best value resorts. It has a 4 star AAA rating and offers an array of facilities. Such facilities include 3 large swimming pools, heated spas and saunas, a gymnasium and a games room and lush tropical gardens. 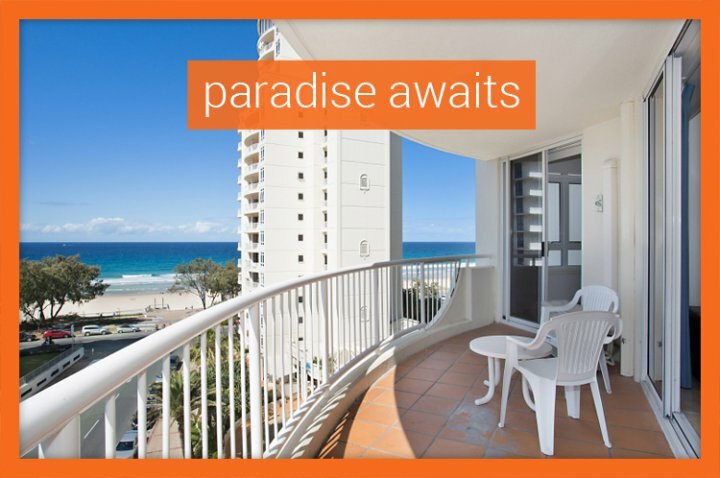 Secure your Gold Coast holiday by booking Apartment 313 for your accommodation. 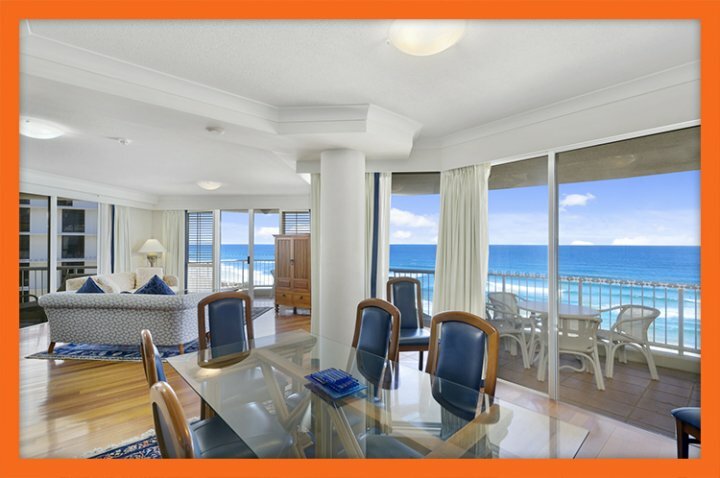 Apartment Overview Enjoy your Gold Coast getaway by choosing Apartment 322 of the Moroccan Resort as your home-away-from-home. 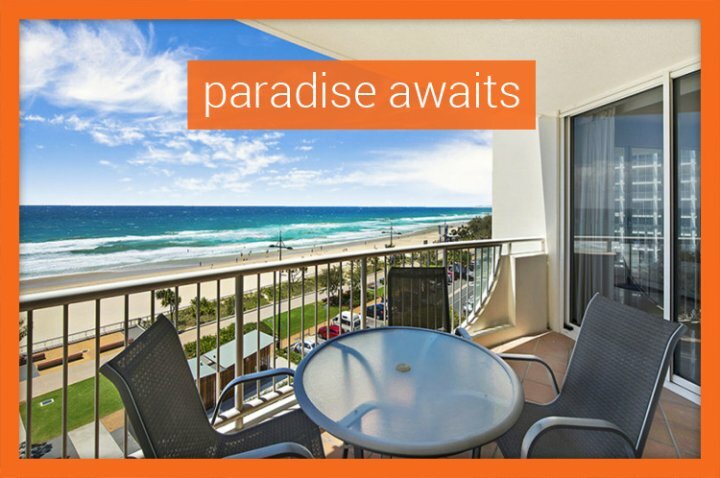 With its beachfront location, Apartment 322 places you metres from the beach, Cavill Ave and the heart of Surfers Paradise. Located on the 10th level of Moroccan Resort, this spacious self-contained apartment contains 3 bedrooms, 2 bathrooms and comes with free parking. 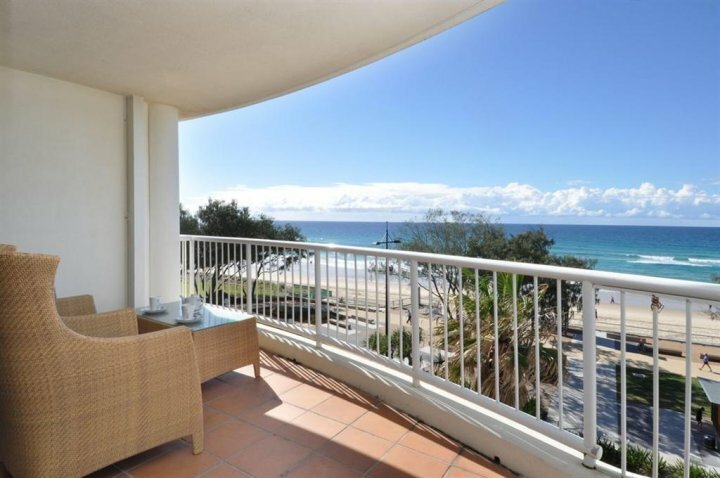 It is ideally suited for a large family or a group of friends looking to share accommodation. 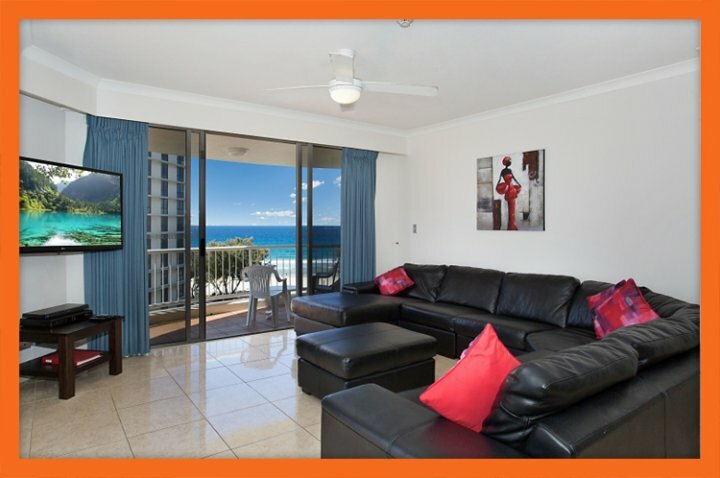 Apartment Features Apartment 322 offers everything you could ever want from holiday accommodation. With an open plan design, it features a fully-equipped kitchen, a separate dining area, lounge, laundry and a private balcony. 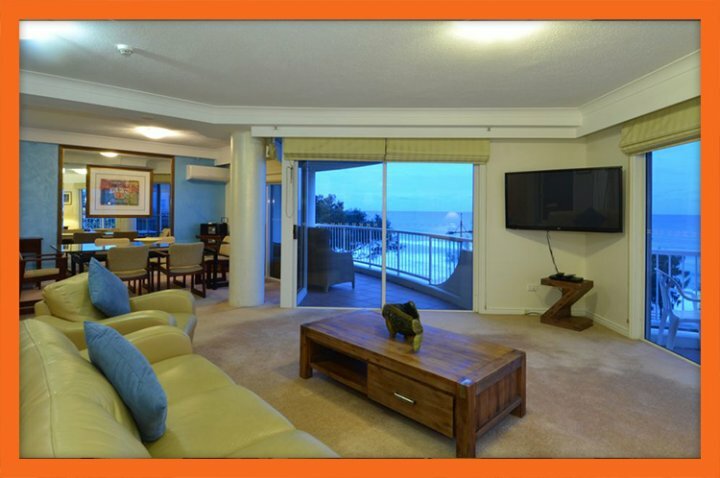 The lounge features a large flat-screen television and complementary Premium Foxtel. The laundry features a washing machine and dryer and ironing facilities. Free parking is also offered with this apartment. 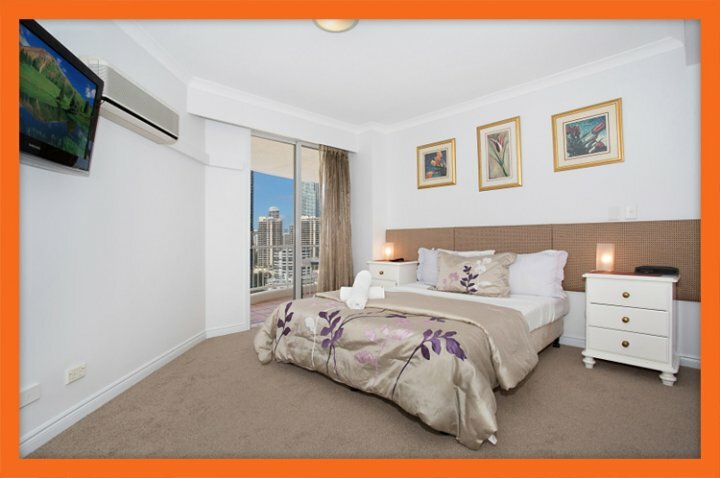 Bedding Configuration Apartment 322 features 3 bedrooms. The master bedroom contains a King bed and features an ensuite, walk-in-robe and balcony access. The second bedroom contains a Queen bed and the third bedroom features two single beds. Both the second and third bedroom is fitted with built-in-robes. 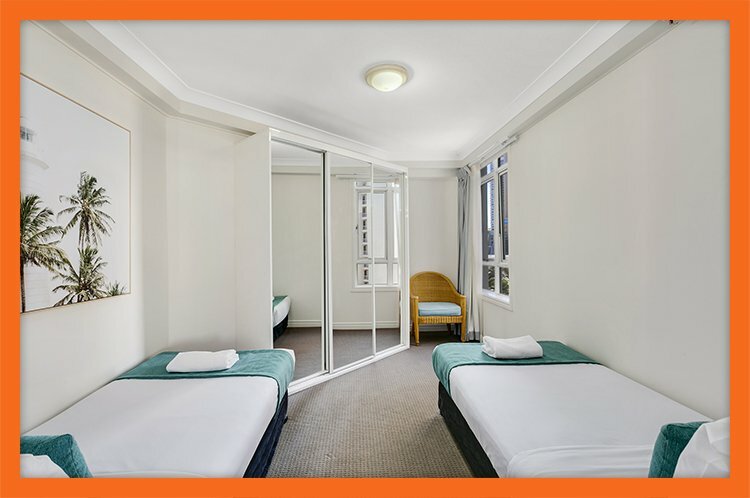 Tariffs sleep up to 6 guests however two additional guests can be accommodated on roll-away beds, which can be ordered at time of booking, for a small surcharge fee. 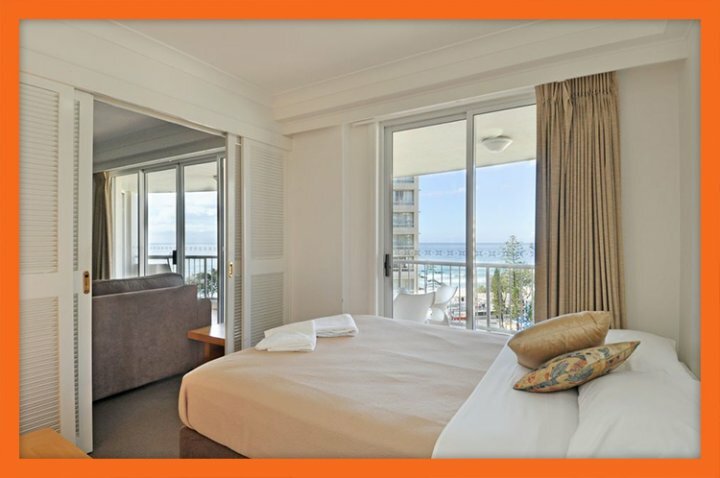 Resort Facilities Moroccan Resort is one of the best holiday resorts in Surfers Paradise and should you choose to stay in Apartment 322, you'll get access to all resort facilities as well. You can enjoy swimming around in one of the three pools of the resort and have a great poolside barbeque experience. 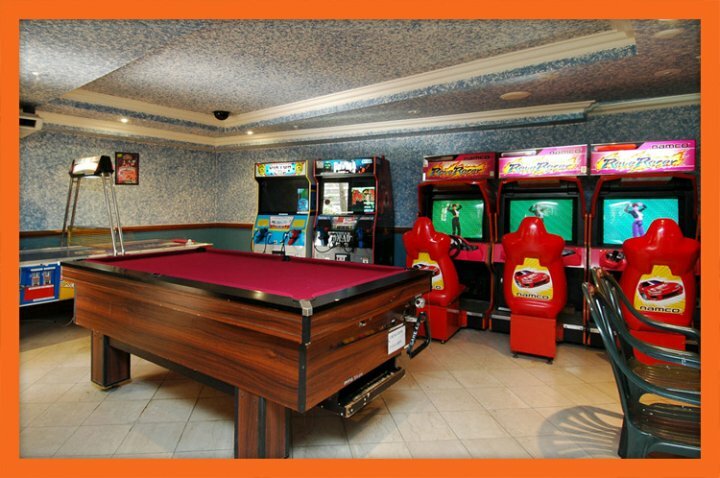 Kids will love the games room of the resort while the gymnasium can help keep you in shape even on your holiday. Heated spas and saunas are other attractions of this resort. 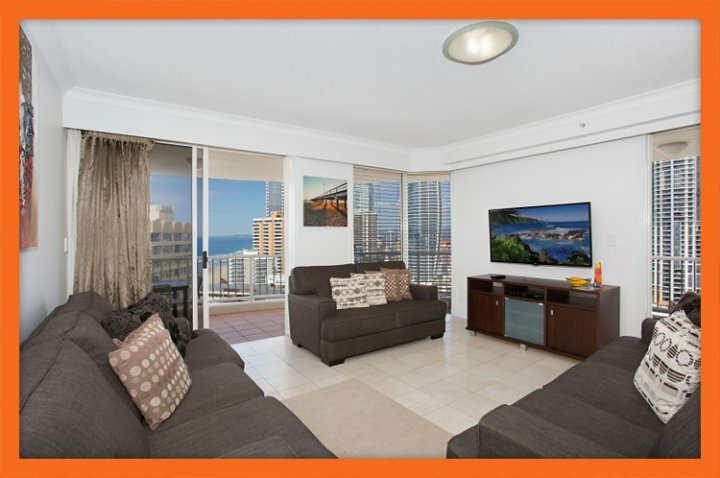 For a Gold Coast holiday experience like none other, choose Apartment 322 for your accommodation. Important Notice The properties listed on this website are managed by their respective owners or by a duly appointed real estate agent. SunMore Holidays is not involved in the management of the listed properties and the listing is based purely on information supplied by the property owner or the appointed real estate agent. While we make every effort to ensure that this information is current and kept up to date, this information may change at any time without notice and we accept no responsibility for any errors or omissions. Important Notice The apartments advertised here are independently operated and managed, and not managed by or associated with the resident on-site resort management. 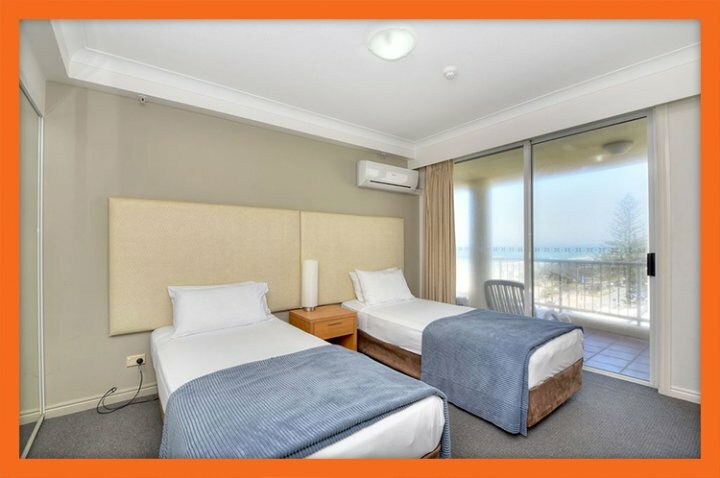 The resident on-site resort management has no responsibility for these apartments, and is not responsible for your booking or stay, including issues relating to check-in, check-out, cleaning, maintenance and parking. For any such issues, please call 1300 664 396 or 0409 446 614. Keys can be sent via Express Post to your postal address, please respond via email if you would like this option (Australian residents only - $16.50 additional cost). 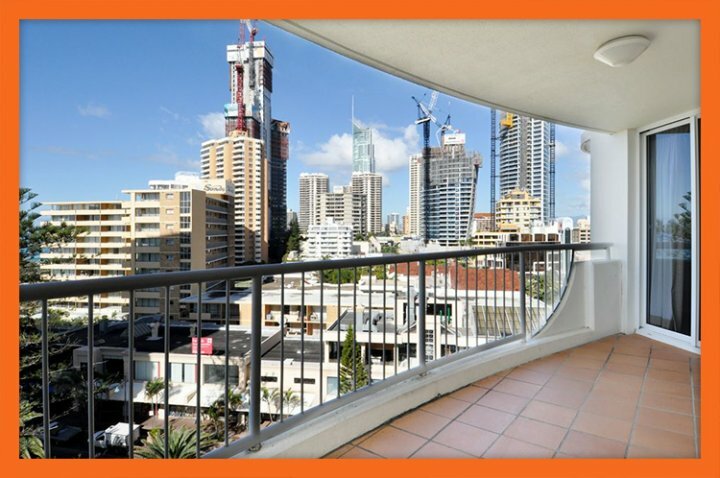 Otherwise keys are to be collected from our office in central Surfers Paradise on the day of arrival (between 145pm and 9pm - Check-in from 2pm only). In the event that we are required to meet you at the property a $66 meet and greet fee will apply. Free under cover parking for one (1) vehicle is provided. 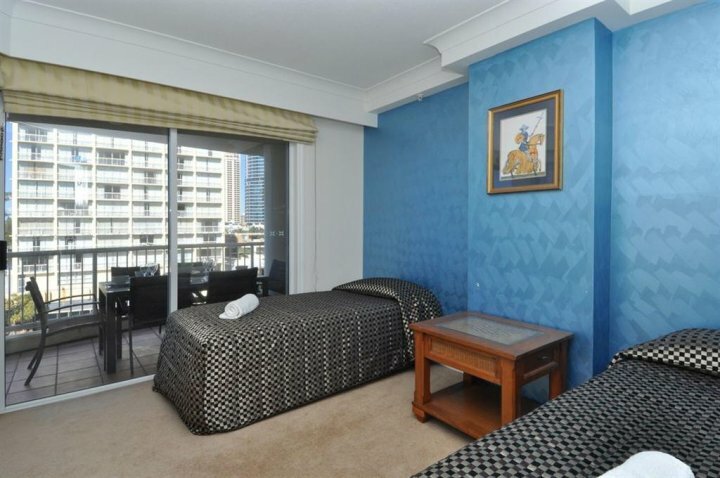 The Moroccan Resort is located on the corner of View Street and Esplanade, directly opposite Surfers Paradise Beach. Entrance to the View Tower and Esplanade Tower (Towers 2 and 3 respectively) is located on View Street while entrance to the Elkorn Tower (Tower 1) can be accessed via 7 Elkorn Avenue (pedestrian access only). 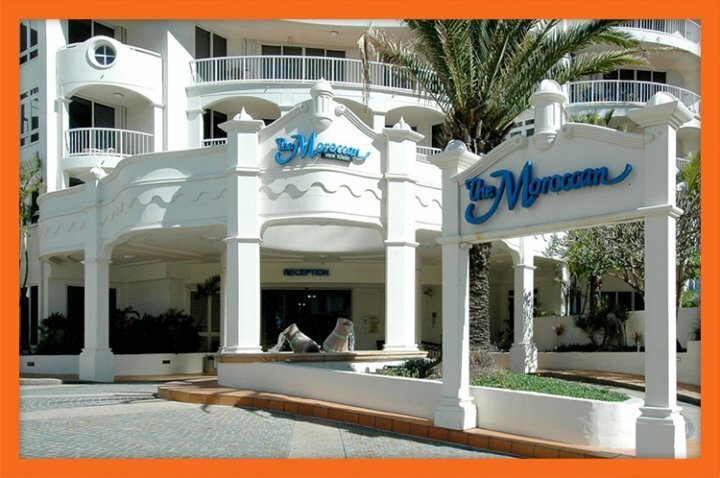 The Moroccan Resort is north of the GCHR office, which on the ground floor (street frontage) of the Cosmopolitan Building on the corner of Surfers Paradise Boulevard and Beach Road. The closest light rail station to the Moroccan Resort is Cypress Avenue which is located 210 metres north of the resort.